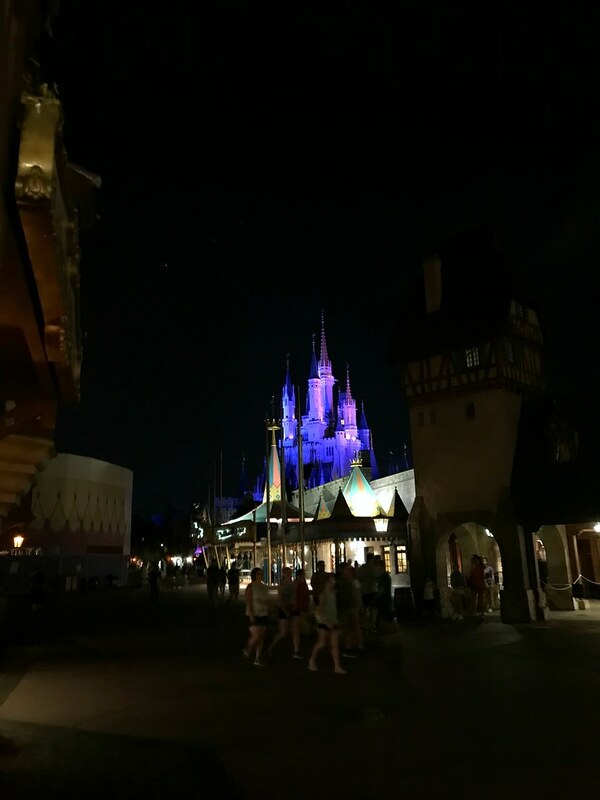 Discussion in 'Disney Trip Reports' started by coloredimage, Jul 30, 2018. 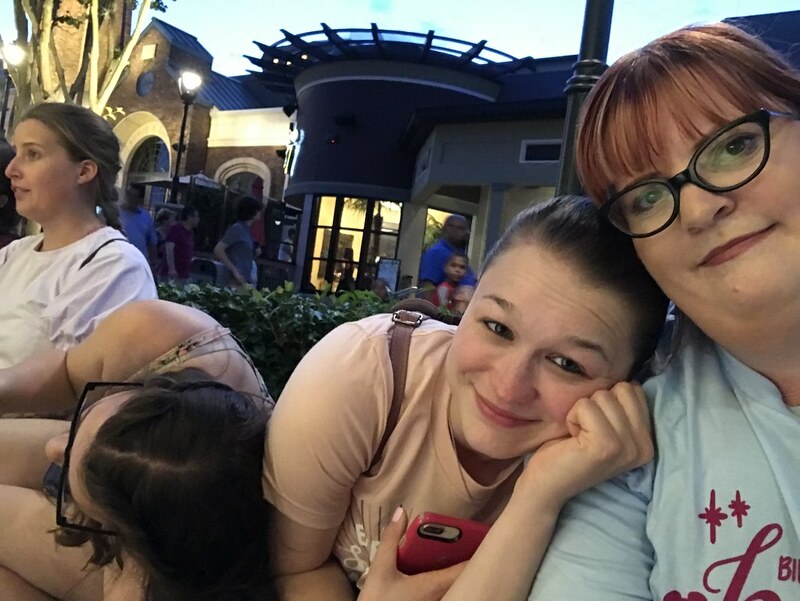 Spoiler: While there are definitely more photos from this day than I had from my weekend in Universal, I found that it was a lot easier to just sit back and enjoy universal with my friends instead of taking pictures. Also, with having to put our bags into lockers so frequently it just became a hassle to take my camera out so often. So, the next morning we were up by 6:30 and met at the front of Art of Animation. We were going to just get an Uber to Universal, but we didn’t want to split up between two Ubers and the only options were for six people. Kyle went to the concierge desk to ask what their opinion was of our options and they offered to get us a Mears minibus. I was hesitant - I have had some bad luck with Mears and Universal before - but it was a good price ($5 each) and we could all go together. So we hopped into the Mears and were on our way by 7:30. When we got to City Walk, we stopped quickly at Starbucks to grab something to eat and were on our way. We didn’t buy our tickets until we got there because we didn’t want to buy them and then decide we weren’t going to go to Universal. We split up into groups - Kristen bought her ticket herself, Jen and Jenny bought tickets together, I bought Sadie’s ticket with mine, and Kyle and Liz bought tickets together. It just made everything easier. But we had gotten there so early we probably wouldn’t have had to do that if we hadn’t already planned it. The night before we had a talk about what people could afford and what they couldn’t, so we had a good handle on what we were going to do for the day. Right away we split up. 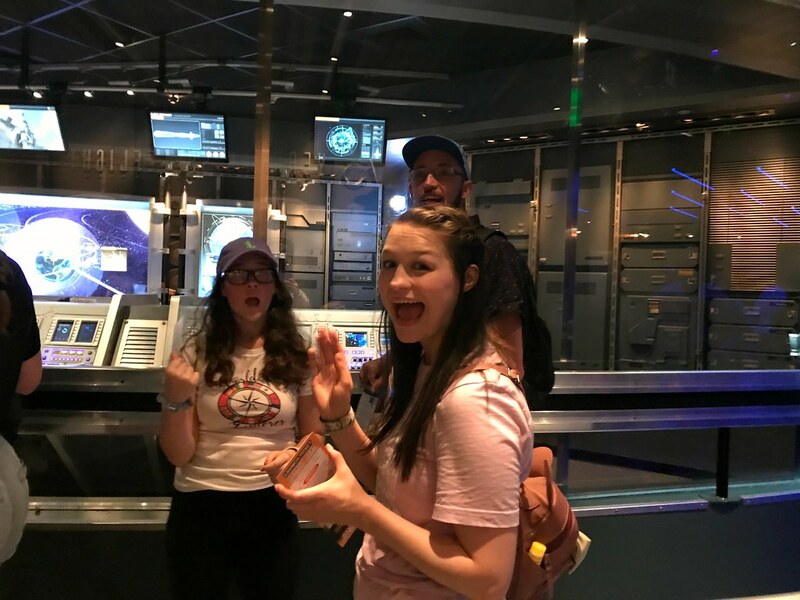 Kyle, Kristen, and Sadie ran over to the gates to Islands of Adventure and rode Hulk, Doom, and Dudley Do Right right away. Jen, Jenny, Liz, and I stayed together. We’re not rollercoaster people so we were going to just walk slowly through Universal and do whatever jumped out at us. We started with Shrek since it had such a short wait. We then hopped over to Jimmy Fallon and rode that. Liz was on a mission to get an Auntie Anne’s pretzel (she loves them, it’s a bit of a running joke) but realized that her money was in Kyle’s wallet. We had decided to only bring three bags, mine, Jenny’s and Kristen’s, so playing bag shuffle was part of the game that day. Instead, we went to ride E.T. It was the longest wait we had so far, 20 minutes, but it was about 10:30 by that point so people had gotten spread out around the park. 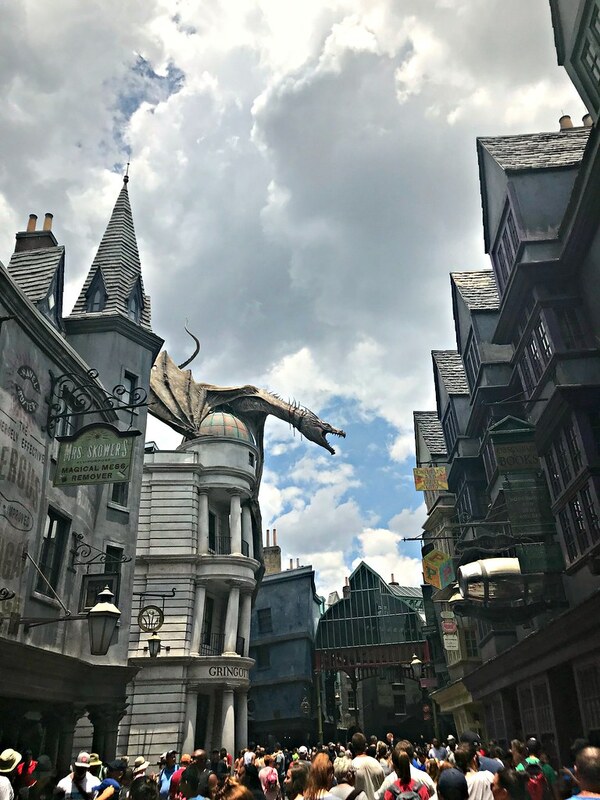 In all honesty, though, the entire day we didn’t really deal with bad crowds - a Tuesday is apparently a great day to go to Universal. 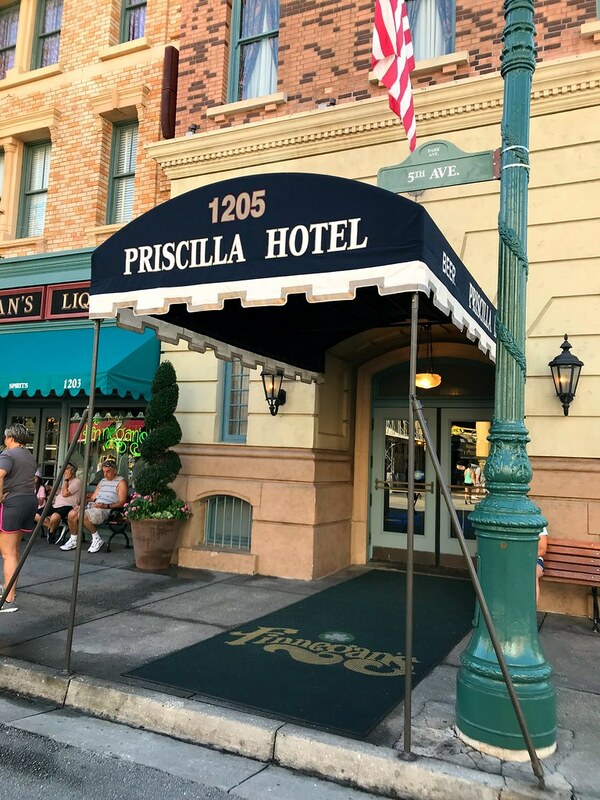 We got a text from Kyle saying that he, Kristen, and Sadie were headed back to Universal to meet up with us and get something to eat. As we were walking past the Mummy we saw that it was still only a 5 minute wait. Liz doesn’t like the Mummy ride but Jen, Jenny, and I love it, so she took my bag and Jen and Jenny’s stuff and waited for us. It was literally a 5 minute wait, which was awesome. We basically walked right on to the ride. Jen sat between us and got her arm stuck against the lap bar during a turn we had all forgotten about so she called it her Mummy bite for the rest of the day lol. Once we were off the ride we went to stand in the limited amount of shade near the stage to wait for the other three to join us. We found them fairly quickly (we were all strongly in theme again on this day) and we offered to hold their things since Rip, Ride, Rock It was a pretty short wait. We spent the time waiting for them talking to the woman next to us. We watched someone lose their glasses off the ride and she joked it was probably someone in her party. When we were all together permanently we decided it was time for lunch. It was only around 11:30 but we hadn’t had much for breakfast and had been up for a while. 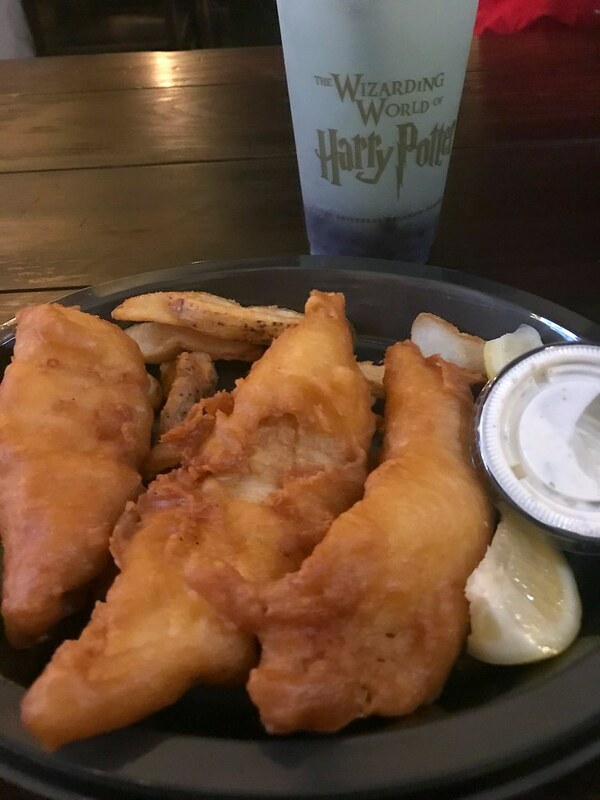 The only thing we knew we didn’t want to do for lunch was Leaky Cauldron as we had all decided it was going to be where we had dinner that night. We weren’t sure where we wanted to go eat but Springfield seemed to be as decent a place to start as any so we headed over there. Since there were a bunch of options to choose from in Springfield Kristen offered to go grab my food while I went to find a table big enough for all of us. I ended up getting chicken thumbs as did Kristen and Sadie got buffalo chicken. 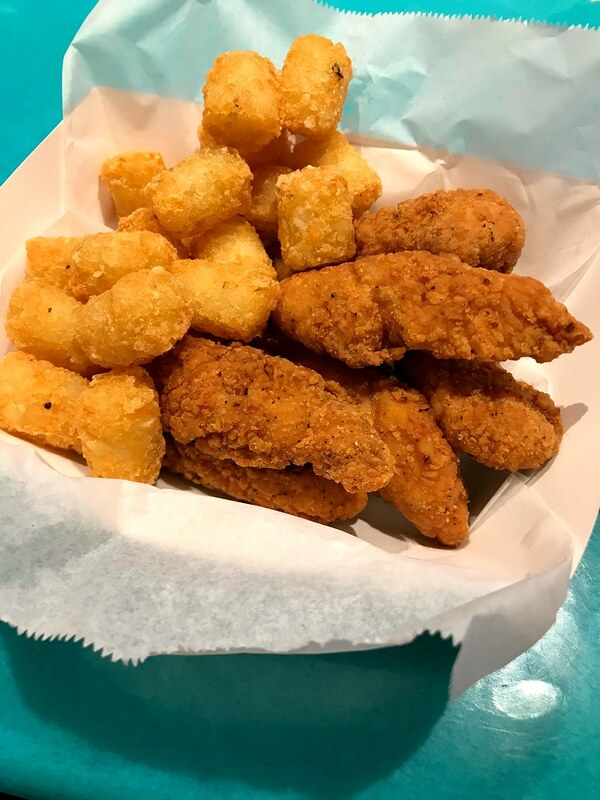 They were okay, not awesome, but regular fast food, theme park chicken. 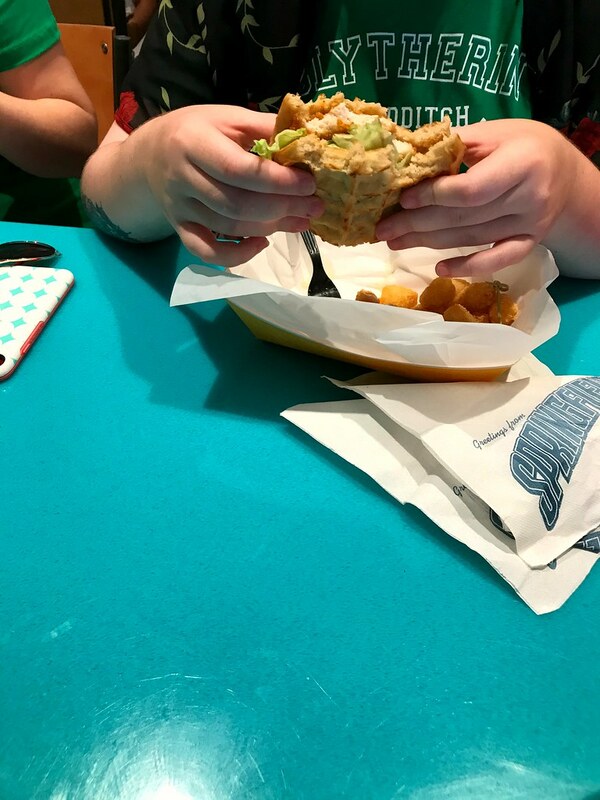 Jen and Jenny got the chicken and waffle sandwich. They liked it in the moment in that it wasn’t soggy or anything, but when we talked about it later Jen said it was nothing special. Kyle and Liz both got carne asada tacos. When we had gone into Springfield the wait for the Simpsons ride had been 20 minutes. We decided that if it was still that short after we ate that we would head there next as our first ride with all of us together. 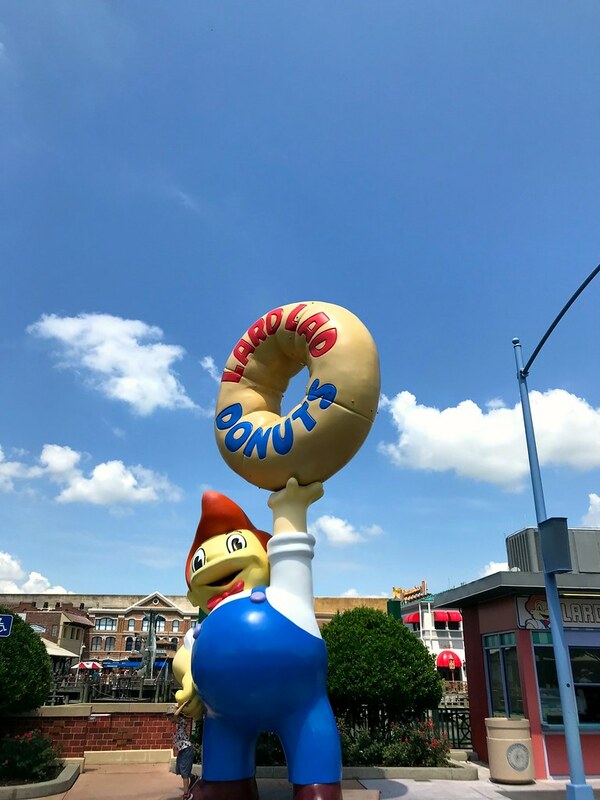 And deciding a donut after the food we had just eaten was a horrible idea, we headed over to the Simpsons Ride to check out the wait. 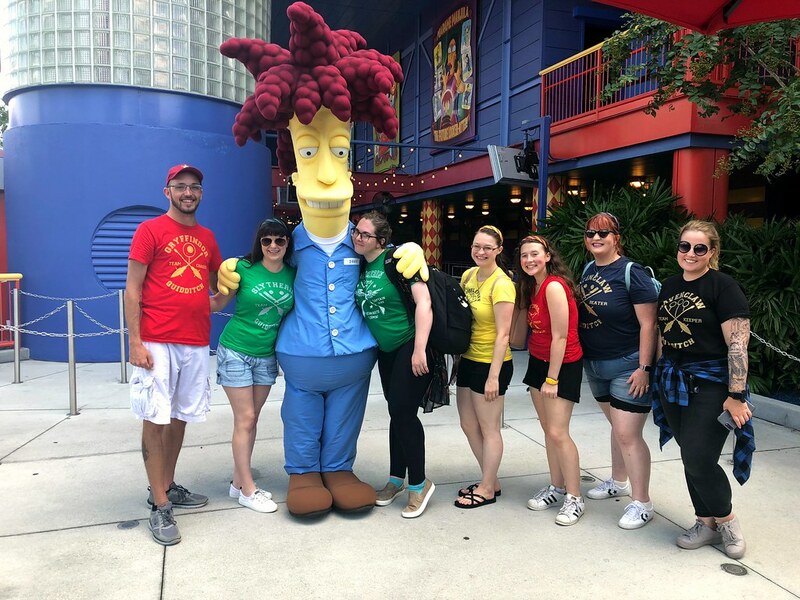 As we were walking over Kyle noticed that Sideshow Bob was out and had a super short wait time. He loves Sideshow Bob (I do too, to be honest) so he and Liz got in line to meet him. 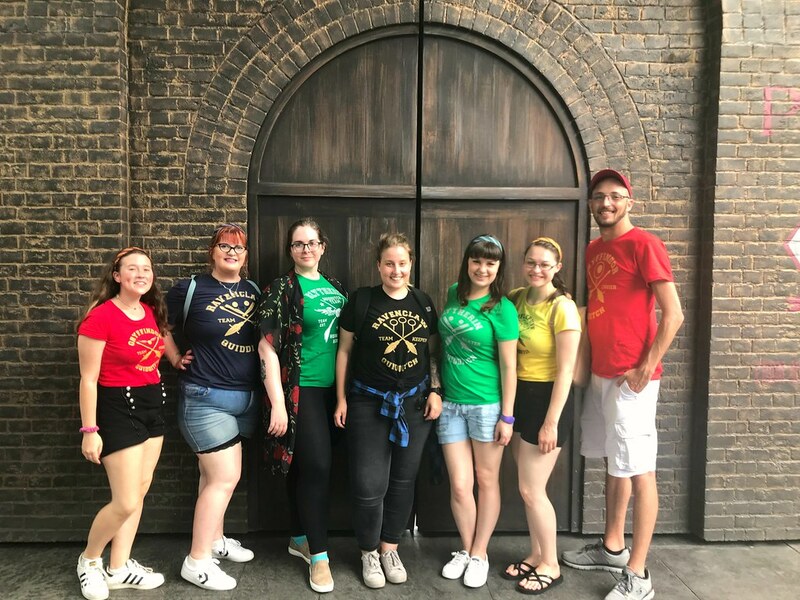 When Bob saw our matching shirts were our Hogwarts houses, he came out of his queue and grabbed Jenny, beckoning all of us to come take a picture with him, Slytherins with Bob. I’m pretty sure our meet and greet with Bob was our favorite of the entire trip that we all did together. We all talked about it a lot after we got back from our trip. After that we got in line for the Simpsons Ride. 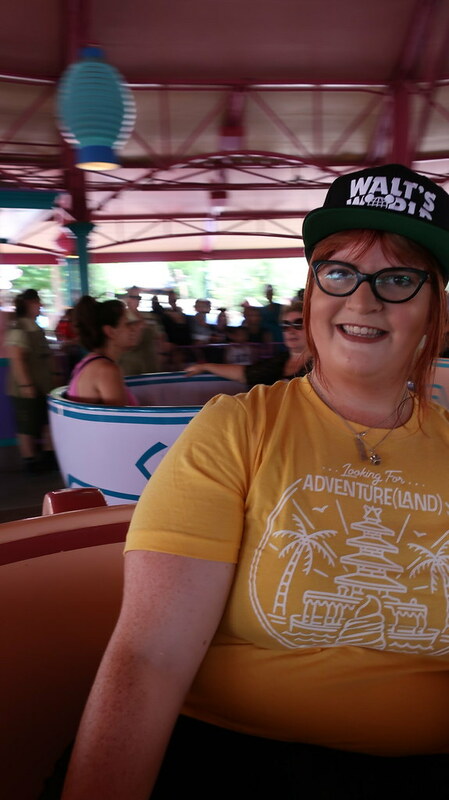 We got to have our own room/vehicle to ourselves which was awesome and let us just be ourselves on the ride without having other people around us that we were bothering. We’re pretty sure the vehicle operator was laughing at us by the time we got off. Oh well! Once off we rode Men in Black because it was a half hour wait. 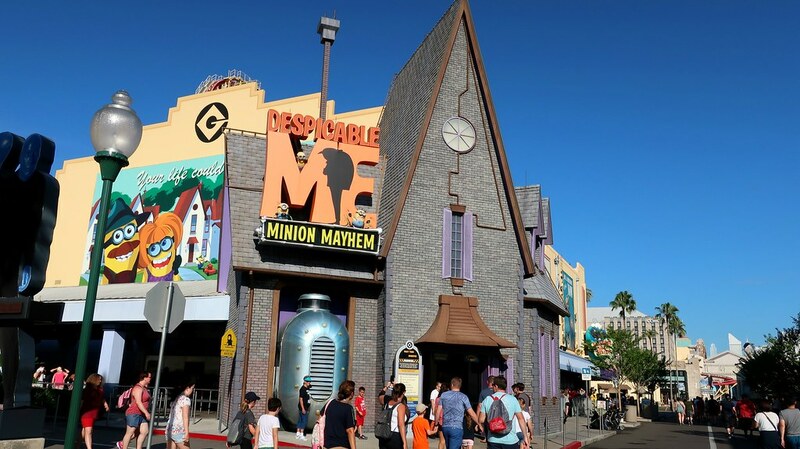 Men in Black is one of my favorite movies and definitely one of my favorite rides. Fun fact: I saw the guy who did the expo intro with us in July as a rides operator in October and recognized him. He did an awesome job and definitely had fun working the ride. Sadie and I rode together. Sadie got the bonus but until that point I had been beating her. 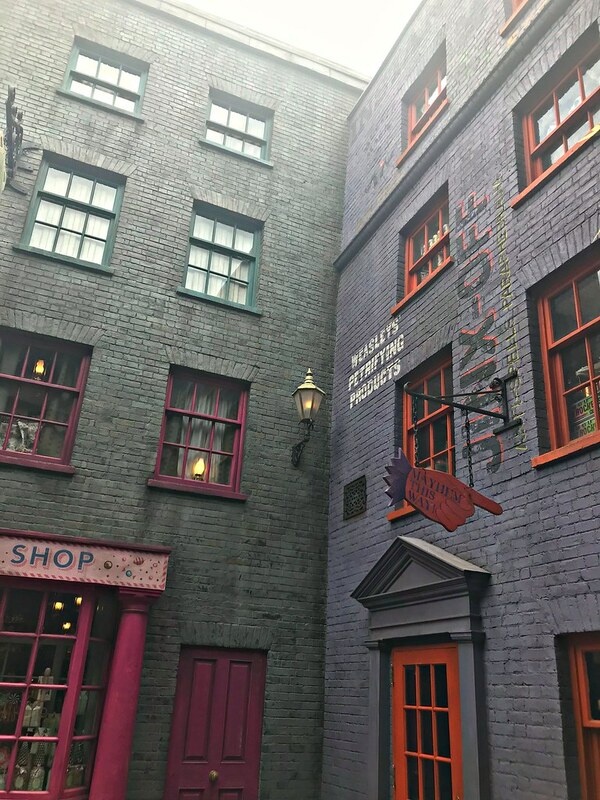 After a quick water break it was time for us to do the thing we all had been waiting for - we headed to Diagon Alley! 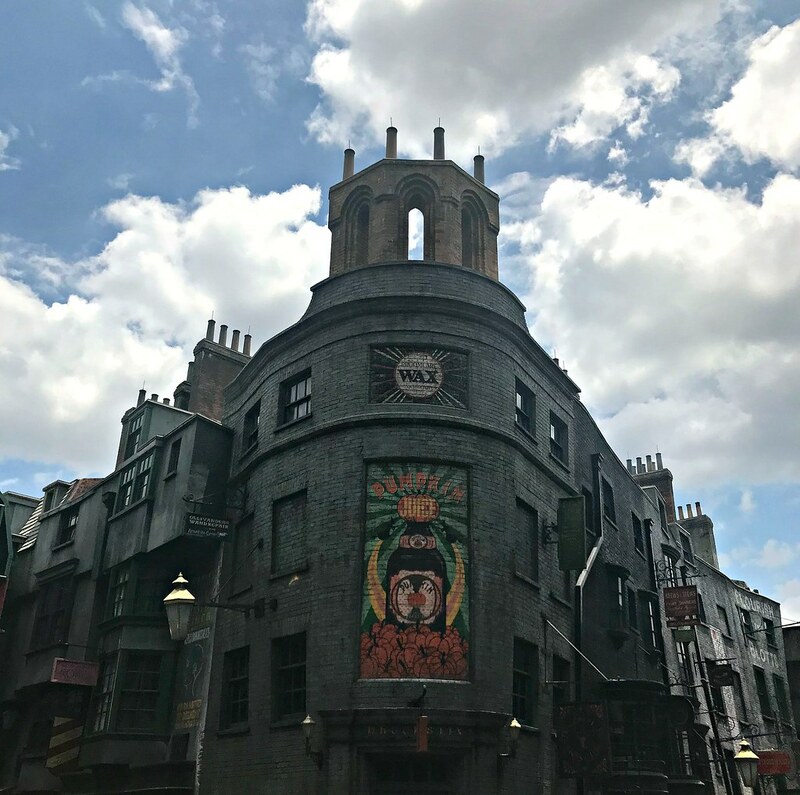 The second we got to Diagon Alley it was pretty close to an hour since we had eaten and we were getting HOT. 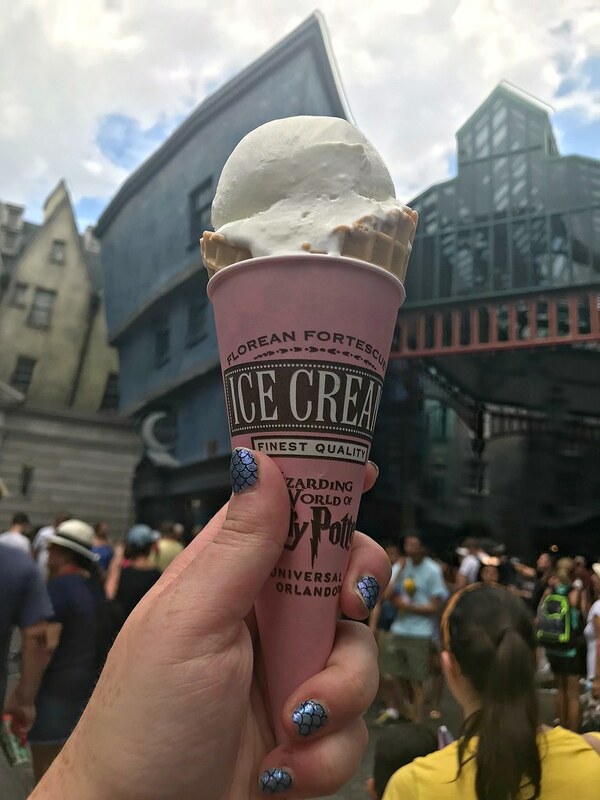 Our first order of business was to head over to Florean Fortiscue’s. Since I hadn’t had much water that day, I also grabbed some water along with my ice cream. I ended up getting my favorite, earl grey and lavender! We enjoyed our ice cream as we walked around and managed to get a group shot of us! After our treat we got into line for Gringotts. It was an hour wait so we spent the time playing games and figuring out our next move for the day. 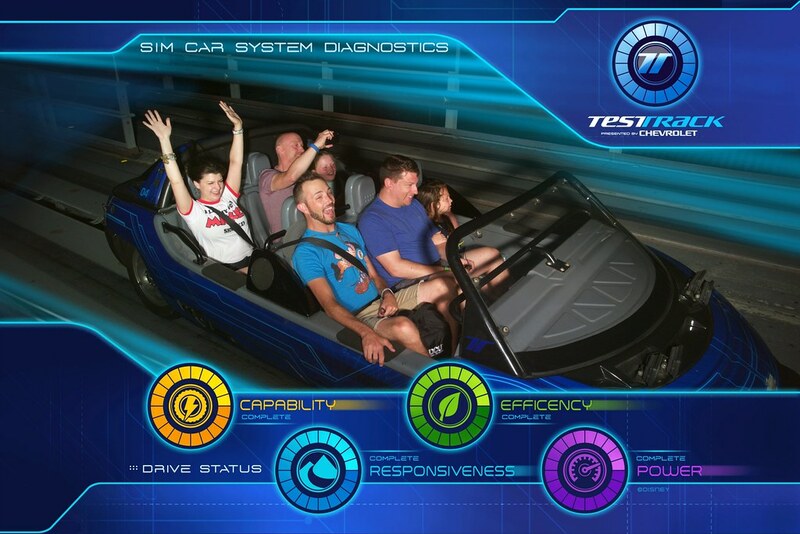 We all had fun on the ride! 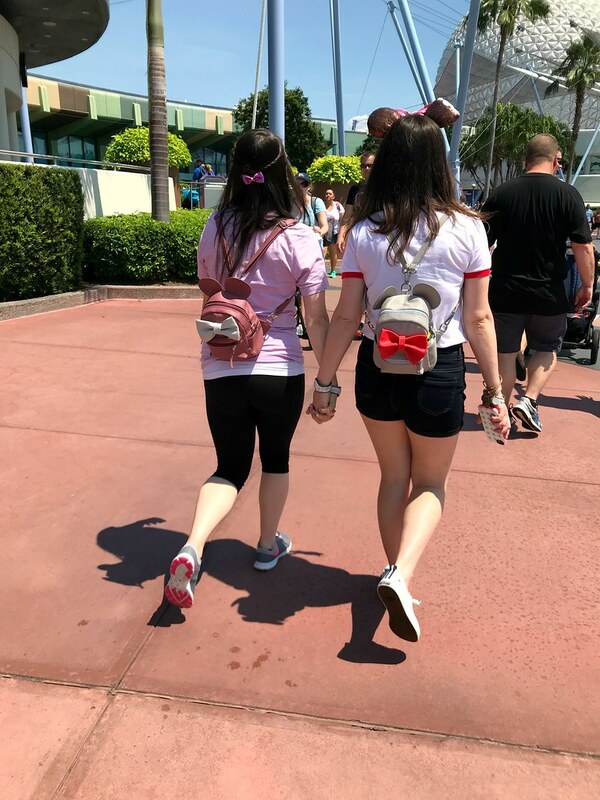 But once we were done we decided to split up - Jen and Jenny were going to stay in Universal to explore a bit more while the rest of us got in line to take the Hogwarts Express over to Islands of Adventure. And by the time we got to Hogsmeade Liz’s friend D was waiting for us there. She had gotten out of work and knew we were at Universal so she drove over to spend a couple hours with us before going home. Even though it was only a couple of hours before we were going to have dinner Kyle was getting hungry. His tacos hadn’t really left him full at lunch. 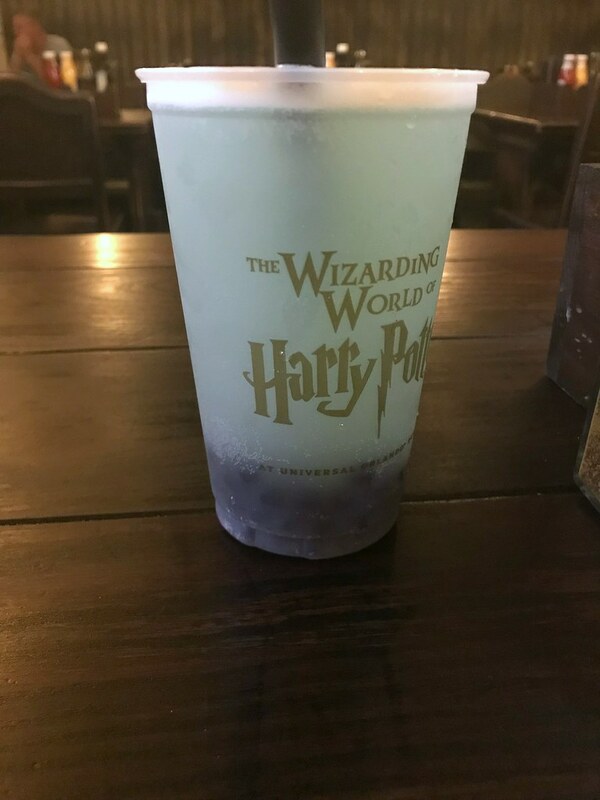 So we walked through Hogsmeade and made our way over to the Dino Institute for Kyle to grab a burger. We all used it as a water/bio break. 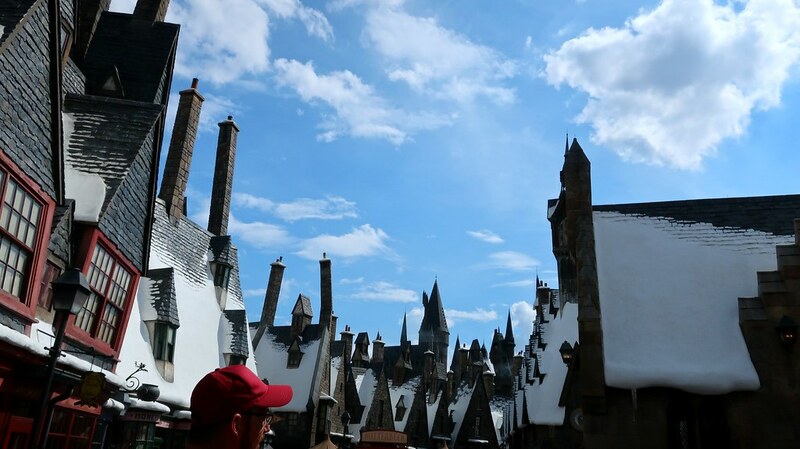 Then we headed back to Hogsmeade. 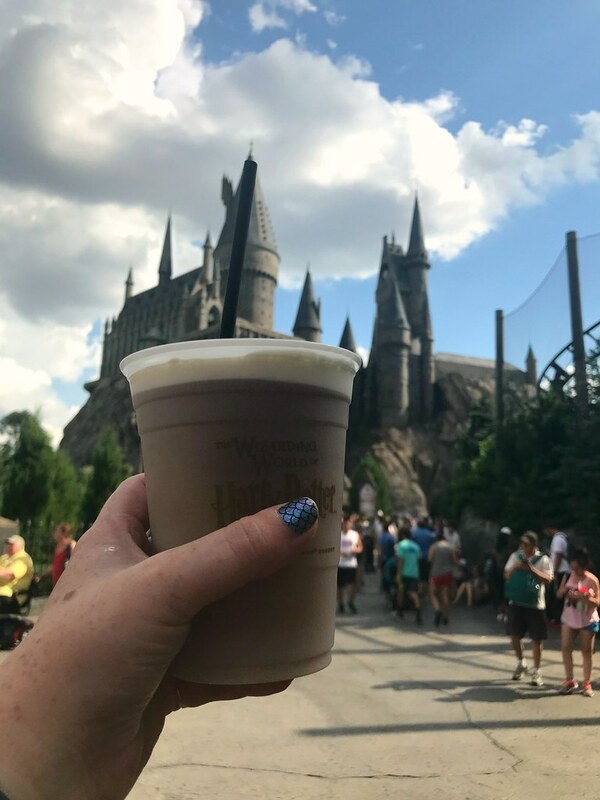 On the way Liz and Kyle both grabbed a drink from the little kiosk right before you leave Jurassic Park and since it was hot and we were going to be standing in line at Hogwarts for the next hour I grabbed a frozen butterbeer to enjoy. 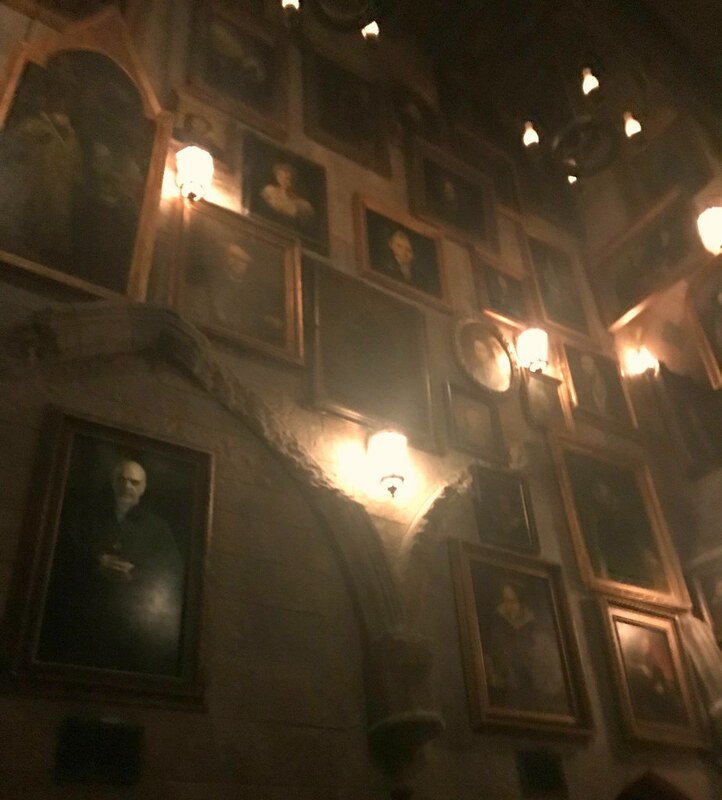 We had fun on our ride through Hogwarts! 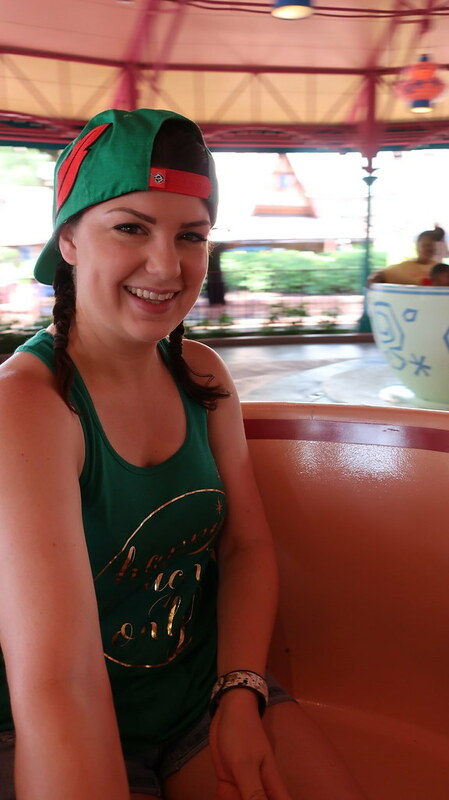 We decided that, since we had some time to kill and it was super hot, we would do a couple more rides before we headed back to meet up with Jen and Jenny. 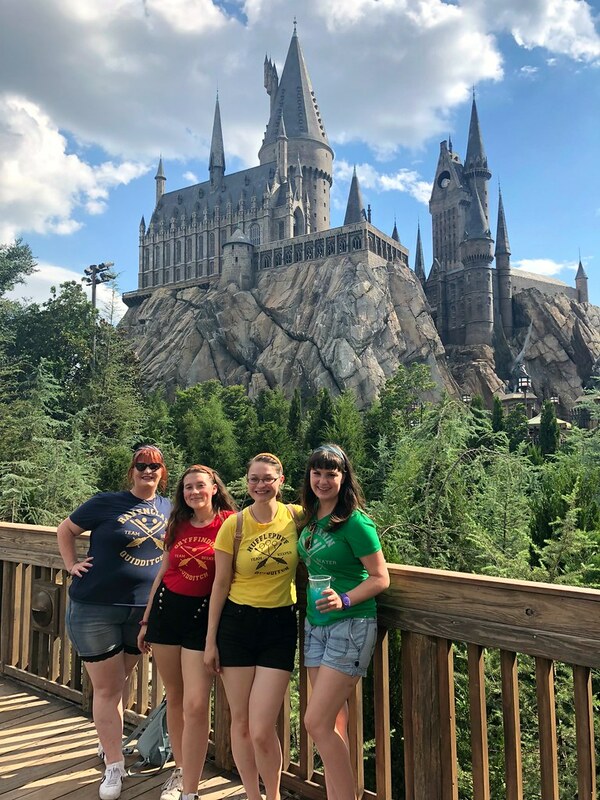 But first D snapped this really cute picture of Sadie, Liz, Kristen, and I in our Hogwarts pride. 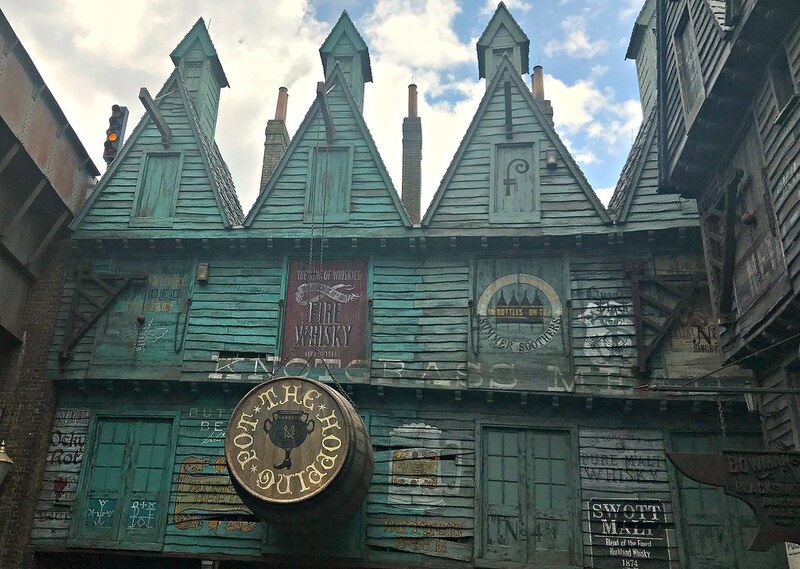 Throughout the day, Kristen got one of two responses from people who saw she was a Hufflepuff: when we went into Knockturn Alley she was told to grab a broom and start cleaning, but when we were in Krustyland she got high-fived for showing off her Hufflepuff pride. 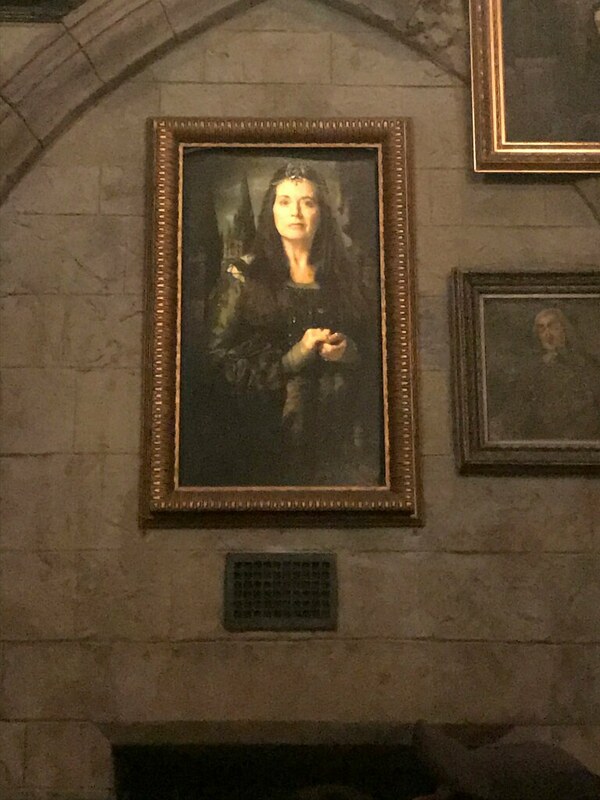 When she got razzed about being a Hufflepuff at one point she said to the Team Member “I am a strong, independent Hufflepuff and I don’t need no other ‘Puff.” This is possibly my favorite quote of the entire trip and was almost the title for this portion of the Trip Report. Kyle’s super obnoxious “And break” that he had us do every time we regrouped seemed slightly more appropriate though. We also stopped in Toon Lagoon because Kyle had broken his sunglasses earlier that day, so he went to one of the stores there to buy a new pair. 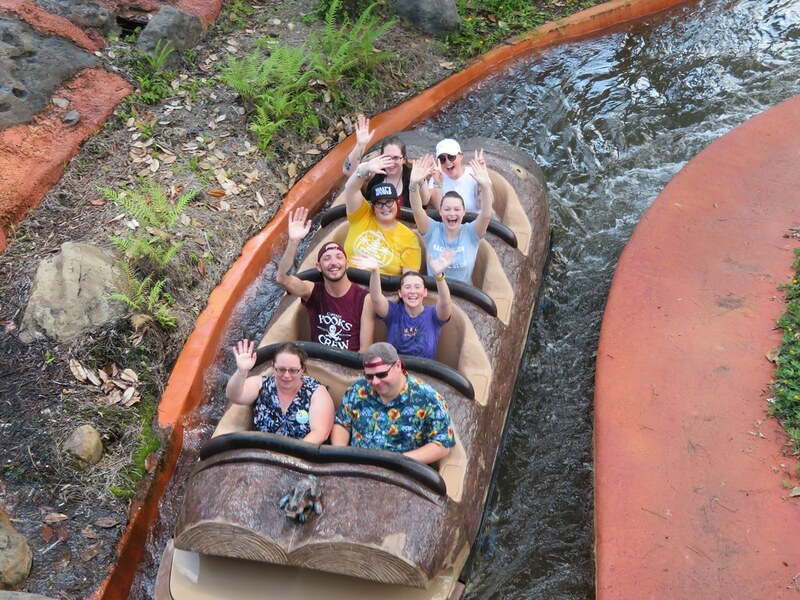 At that point we were all super hot and uncomfortable so we decided why not ride Bilge Rat Barges? The posted wait time was only 20 minutes. The actual wait time was closer to 5. It just took that long to walk through that darn queue. I remember once, when I was like 14 or so, we got stuck in the queue for Bilge Rat Barges for 3 hours because of lightning in the area and there being no escape because of the way the stanchions are built. We had a 7-8 year old with us (it was a family trip that year) and we played so many games of 20 questions. So. Many. Games. This time though we barely had time to talk! We got into a boat with a couple who were a couple years old than us and were thankfully just as ready to have a good time as the rest of us. They started laughing at D and I because we were clinging to each other, desperately trying to avoid the torrent of water that was aimed directly at us. In the end, we were drenched! I normally hate water rides but that day it was definitely needed. However, it took forever to dry off and we were those people who still went on to another round of rides. Spider-Man to be exact. The wait was a half hour and you could definitely tell where we had been standing for a long period of time. I officially apologize to anyone who had been near us during that time. We also hated ourselves. But at least we weren’t over-heating anymore? Spider-Man was our last ride in Islands. It was getting late and we had to meet Jen and Jenny for dinner. Also, D had to get home . We decided that it would probably be faster to walk back to Universal through the front gates. We also didn’t really want to go onto the Hogwarts Express still wet. So we followed D out and headed back to Universal. It was kind of raining as we walked. And once we got back to Universal it was about 7. 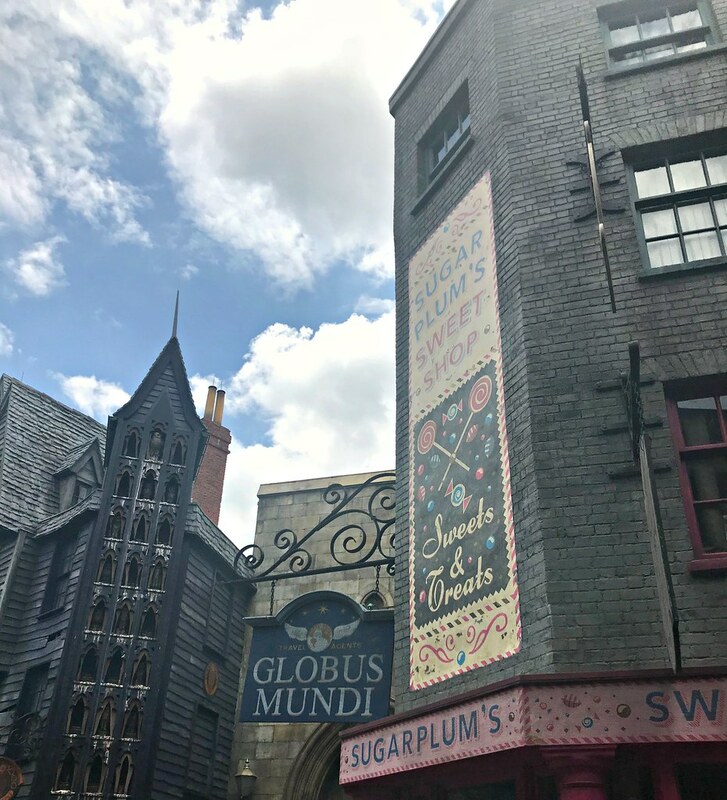 The Superstar parade had just started so we had to dodge through the streets in order to get back to Diagon Alley. We barely made it. Also, my friends are a heck of a lot faster than I am so they had to stop and wait for me. Jen and Jenny were waiting for us on the stage in Diagon Alley. They had done some shopping and watched some of the shows while we were away, but we were all ready for some dinner. Liz got the banger sandwich. Kyle got fish and chips with a glass of wine. Jen got cottage pie and butterbeer. Jenny also got the same thing but my notes says her was a piespolsion? And Sadie and Kristen both got the kids mac and cheese. Which is a gigantic portion, by the way. Once we finished eating it was close to 8. We really had no interest in staying much longer. 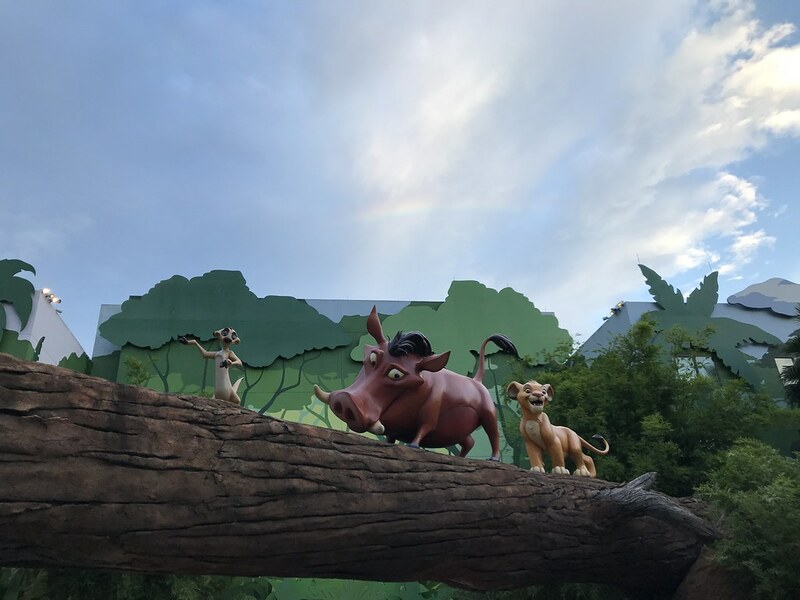 We had hoped we could see a soft opening of the new water show since we knew that was supposed to happen that day, but with the storms rolling in we doubted it would be worth it to stay. Kristen just had one request - she needed to stop at Ollivander’s to get a wand for her mother as a present. The last time I had gone to Universal at all had been 8 years earlier. 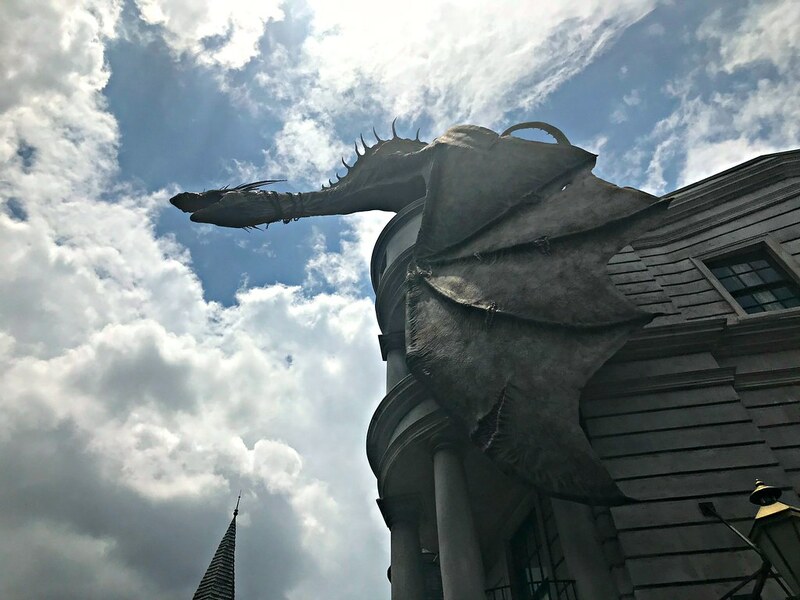 It had been myself, Jen, and my mother and we had gone for the morning just to see Hogwarts the summer it opened. 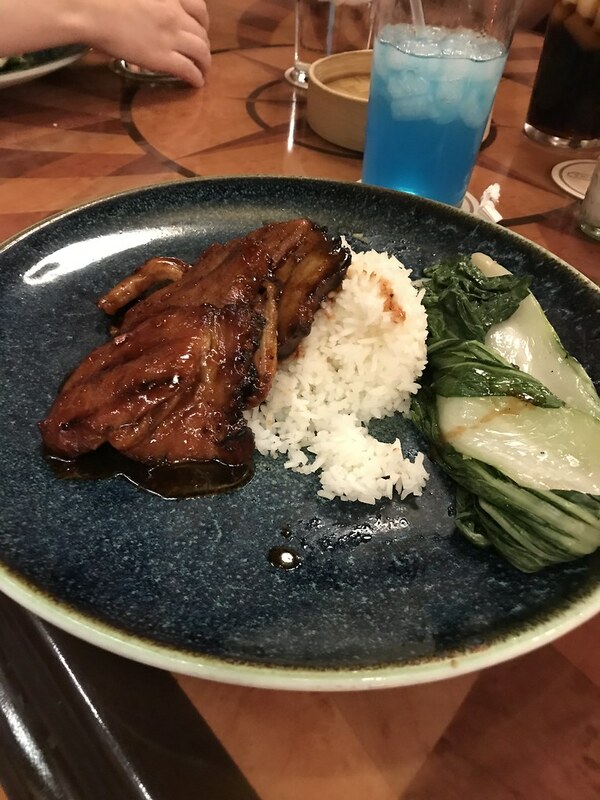 We had dinner reservations at Epcot that day because my father really doesn’t love Universal so he decided to run some errands in Orlando then meet us back in Disney that day. So, we took a Mear’s taxi to Epcot. The guy kept referring to the park as “Efcot”, took the normal car lane at the gate instead of the taxi lane, got mad that he had to be $14, then couldn’t figure out where to drop us off (because he was nowhere near the taxi drop off) so we got out in a random aisle in the parking lot, paid, and ran for it. This is the taxi ride that has stuck with me throughout my adult life, even though I have taken many taxis before that and since then. This time: We had a driver that seemed okay. He wasn’t chatty but whatever. Kyle tried to make small talk but the man didn’t really respond. When we got to AoA instead of taking the right to go into the guest drop off he took a left towards the bus lane. Instead of just continuing in the through lane next to it and turning around he DROVE ONTO THE SIDEWALK. Like up the dip in the pavement for wheelchair access. TURNED AROUND ON THE SIDEWALK then went OVER THE CURB. We all thought the van was going to tip over. It was terrifying. Once he pulled up to the actual passenger drop off there was a cast member waiting. He came over to the driver’s side window and I didn’t hear what was said specifically but the gist of what I heard was that they had taken down his plates and they were calling Mears with a complaint and that he may have to pay for the repainting of the sidewalk. The next morning when we walked by there were definitely skid marks on the pavement. Also, his card reader didn’t work. Kyle put his card through to pay and it wouldn’t go through. He blamed Kyle’s card, but Jen tried hers as well and it didn’t work. It kept saying connection error. Jenny handed over cash just so we wouldn’t have to deal with him anymore and we fled to our rooms. We were back in our rooms and going to bed by 11 pm, which is probably the earliest we went to bed all trip! Also, the second we got back into our hotel room the skies opened up and a gigantic thunderstorm started, so at least we got out of that. Our next day was going to be a later day for most of us, which we were all excited about. Plus poisson? Extra fish? Maybe? What an insane taxi ride! I wonder if he was banned from Disney somehow. 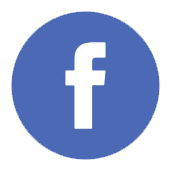 Imagine that notation in your employee file! Love the shirts! Where did you get them? 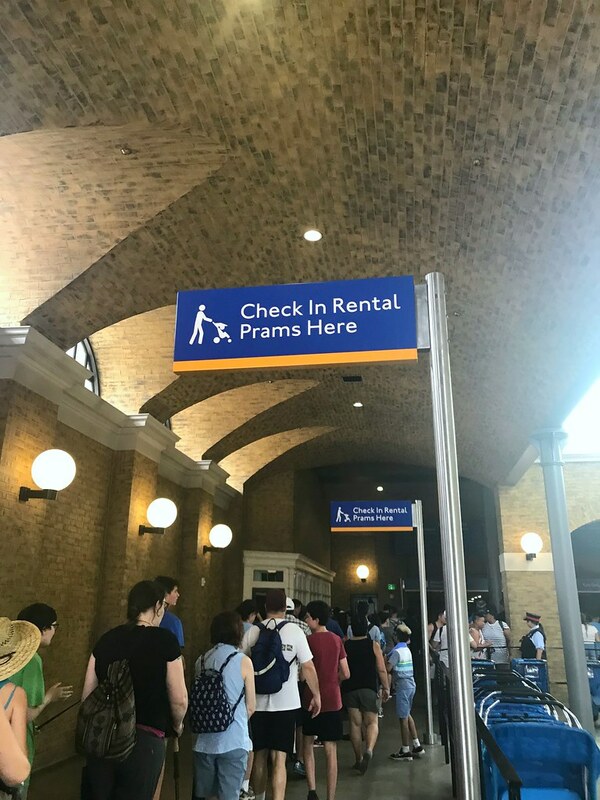 The Hogwarts shirts? I got those off of Teepublic! Oooo man it took a while to get this part out! I'm still in the middle of editing the photos I took from July and between the holidays, work, and then getting sick I took an unintentional break from the DiS. I'm hoping to get the majority of my photos edited over break so fingers crossed! Chapter Four: Make A Wish!! The next morning most of us got to sleep in a little bit. Liz and Kyle however? They did not. About two weeks before we went to Florida Kyle decided that he wanted to have a breakfast reservation. So they left around 7-ish to get to the Grand Floridian for a breakfast at 1900 Park Fare. The rest of us got to sleep until 7:30, and were out the door by 8:30. This was going to be a long day. 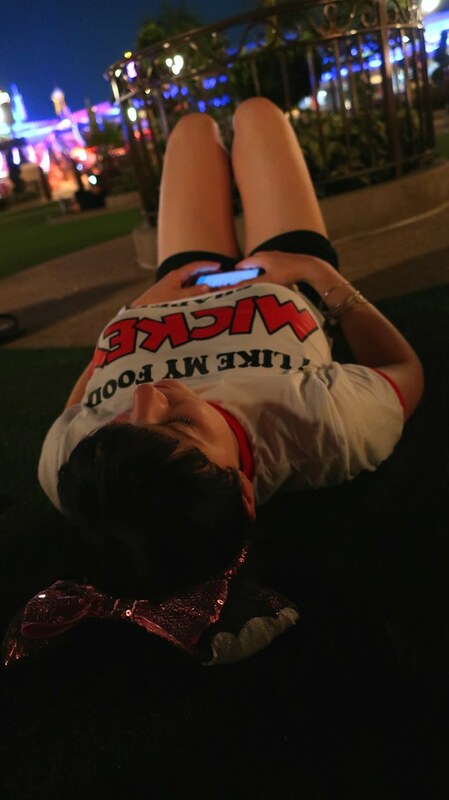 We were getting to Epcot for rope drop then spend the evening at Magic Kingdom for evening EMH, so we were trying to get slightly more of a relaxed morning. 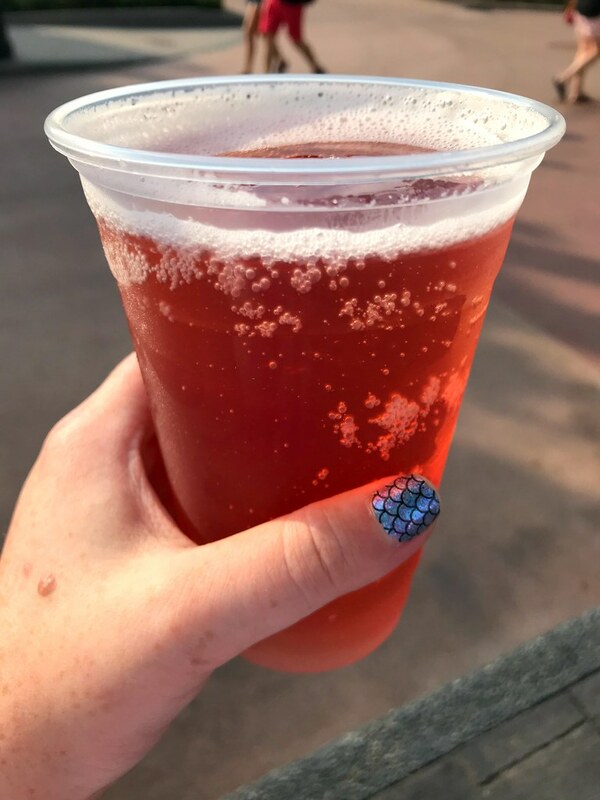 We also knew we were going to be spending quite a bit of time eating/drinking around the World Showcase so we didn’t want to push ourselves too hard. We also had a plan for the day: everytime we had something to drink that was not water, the next thing we had would be water to make sure nobody got dehydrated or sick. Sadie met us at our room and we hopped onto a bus. Once we got to Epcot, it took a while to get through security, but once we were through we headed directly to Norway. 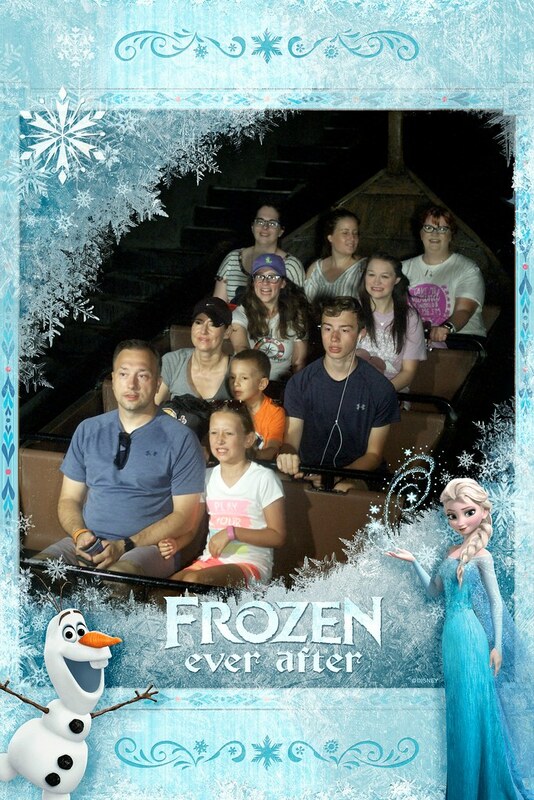 We all wanted to ride Frozen and the wait was like 5 minutes because the park had just opened. I mean, it’s Frozen. It’s cute enough. I miss Maelstrom. 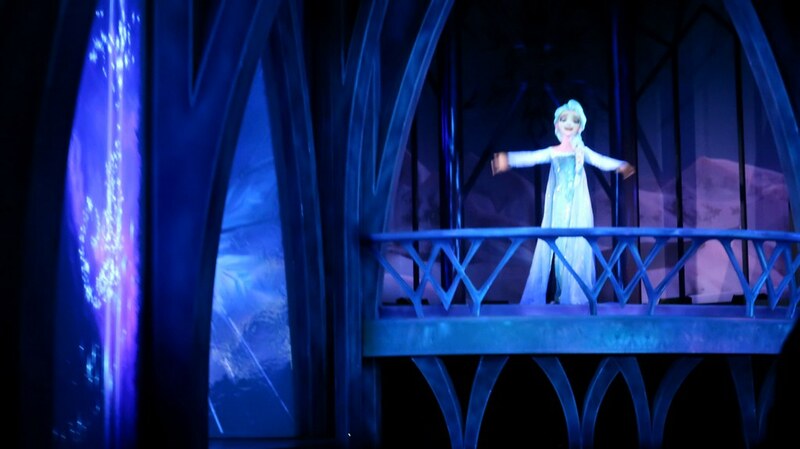 But Elsa was totally broken. She didn’t move at all and just sass-stared at us. We actually thought it was kind of hysterical. While Kristen and Sadie got a bagel. We sat down in one of the tables with the back against the stairs to make sure we could see when Liz and Kyle came in. Kyle found us first. And took advantage of that by throwing his sunglasses at us. We are truly adults. I promise. Kyle had woken up with a bit of an allergic reaction to something. We don’t know if it was because he accidentally ate something with coconut (which he’s allergic to) or if it was pollen or just a head cold but after our ride on Soarin’ we headed over to Mousegears in search of some Benadryl. Since Kyle would need something to drink with it we headed back to Club Cool and had some fun trying the different sodas. Kyle also got an actual drink so he could take the Benadryl. After Club Cool we headed to our next Fast Pass - Mission Space. We split up here, with Kristen, Sadie, and Kyle going to the orange side while Jen, Jenny, Liz, and I stayed green. Our line was a little shorter so we were out one cycle before them and hung around in the gift shop for them for a few minutes. 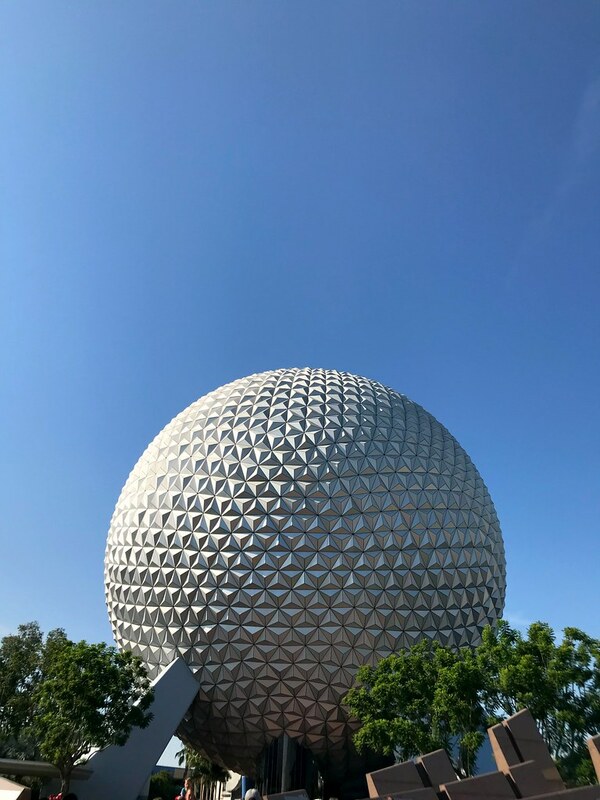 Our last fast pass of the day was for Spaceship Earth, which is a favorite of ours and we knew that if we didn’t get fast passes, being a big group, we would probably not get on. So we got on our continuously moving vehicles and went for a tour around history. The second stop, in 1960, was definitely a stop that happened because something went wrong, not the usual wheelchair stop. We were there for a solid 10 minutes. But the other one was definitely a wheelchair stop. 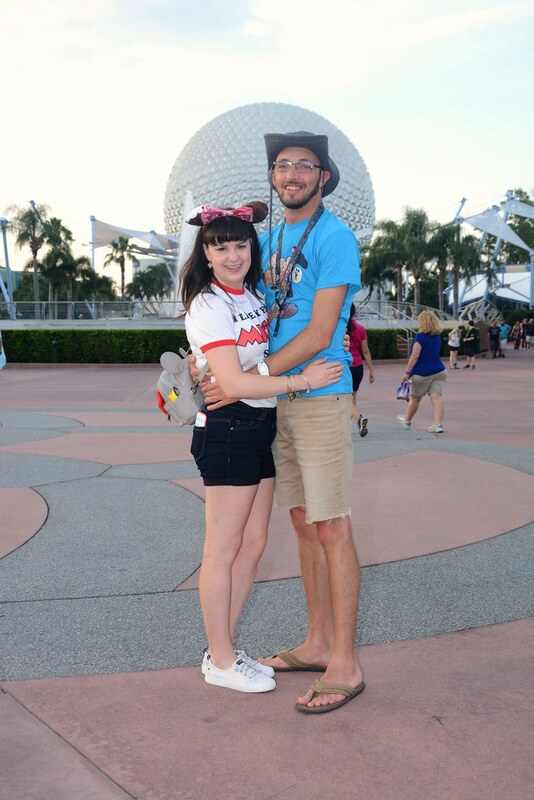 But by the time we got off Spaceship Earth is was after 11 and we definitely wanted to start our journey around the world. So as we journey around the World (Showcase) I just want to mention we did a lot of hanging out in countries, looking at stores, etc. I feel like as I wrote this out it looks like we ate, had a drink, went the the next country, and repeated the process. But it was really at least 45 minutes between each snack or drink item I promise. We started in Mexico and the hostess at La Cava was nice enough to set up a couple of the smaller tables together for us. We had told her that if only the standing tables would accomodate us then we were okay with that but she insisted. Everyone working there was wonderful. We got margaritas, of course. I didn’t take down who got what out of the types I wrote down but here are my best guesses based on how well I know my friends: I know I got the pineapple one - I think Kyle did as well? Liz got cucumber because it’s her favorite, Kristen probably got the pineapple, and Jen and Jenny may have both gotten avocado? Jenny could have gotten cucumber? We also got some appetizers and water. It was hot already and since we had no specific real lunch plans we wanted to make sure we were still eating something throughout the day. When we got to Norway the wait time for Anna and Elsa was only 20 minutes. Since this was kind of Liz’s best day to get all her videos for her niece’s birthday present we hopped into line. The line was only probably 10 minutes long. Kyle actually stepped out of line thinking he would be able to come back to us before we went in but wasn’t able to get back to us in time. 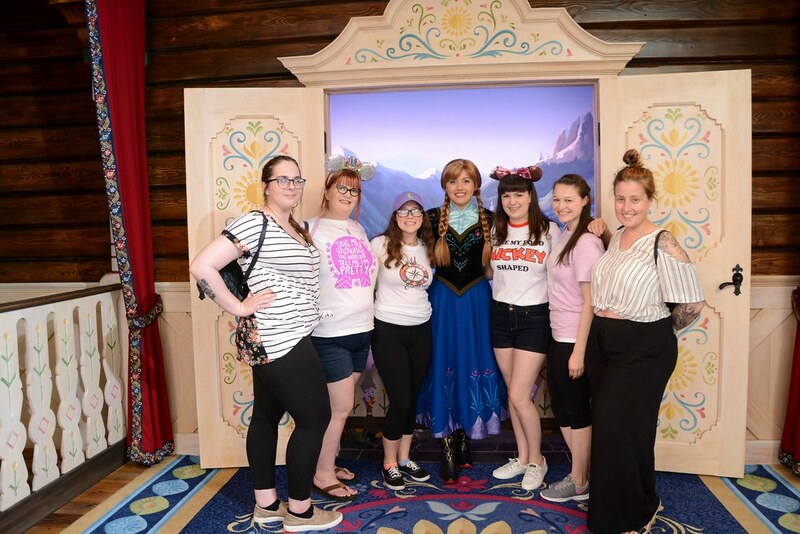 But we had a blast with Anna and Elsa anyway! We met up with Kyle just outside of the Summerhaus. 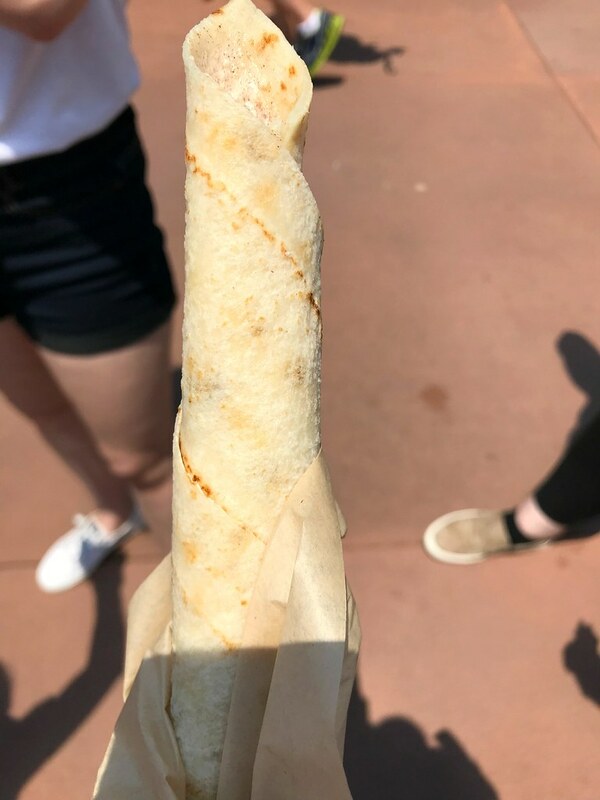 Kringla was closed but they had the cart with some of their best sellers at a cart so I was able to get my favorite - lefse! Kyle tried some of it. He did not approve of it I don’t think. Whatever, more for me! When we got to China Liz got a mango gingerita while Kyle got two ducks in love, which was really good from the little bit of it I tried. We looked around the China pavilion and as we were walking around D joined up with us. We had a water and shade break, then continued on through the World Showcase. 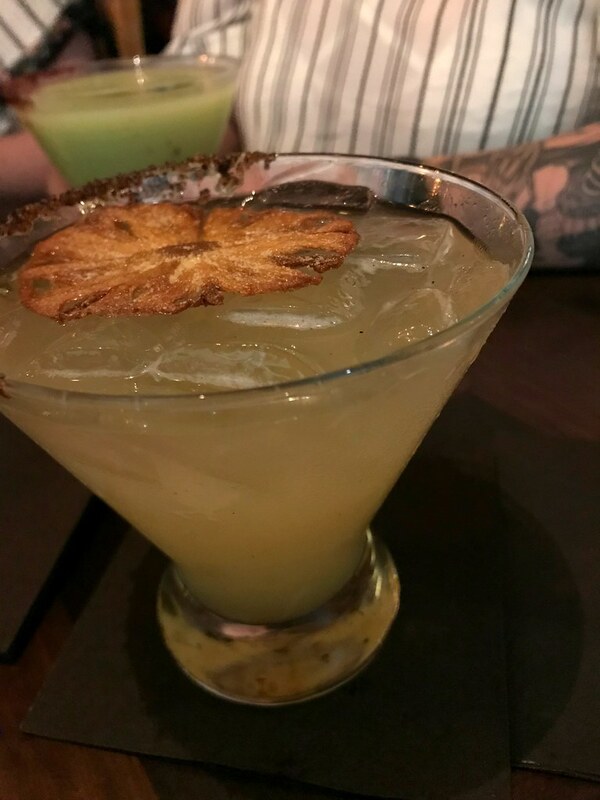 We drifted through to Italy, where we stopped to get an Italian margarita. It was getting so hot that the limoncello was super refreshing. The American pavilion was a bit...well. We went into Fife and Drum to get waters. There was no one in there. Literally no one. So we went up to the counter and asked if we could have 8 cups of water. The woman who originally started helping us was super sassy about it and kind of rude. For water? I dunno. It was a bit strange. We sat inside Fife and Drum to drink our water and just kind of talk about what we were going to do next. Kyle, Jen, Jenny, and Sadie were kind of hungry and really wanted something from the quick service in Japan so we started to head there when I realized I had left my camera at the table at Fife and Drum. Liz RAN back to the America Pavilion and got it for me, which was sweet of her. The man who had found it who worked there was much nicer than the two women who worked there and knew Liz was coming for the camera because he had gone through the pictures to make sure he would recognize whomever came looking for it. Once we were safely back in Japan we split up - Kristen, Kyle, D, and Liz went to France before Belle’s final meet and greet of the day was over as it was her only time to meet Belle and get her video. 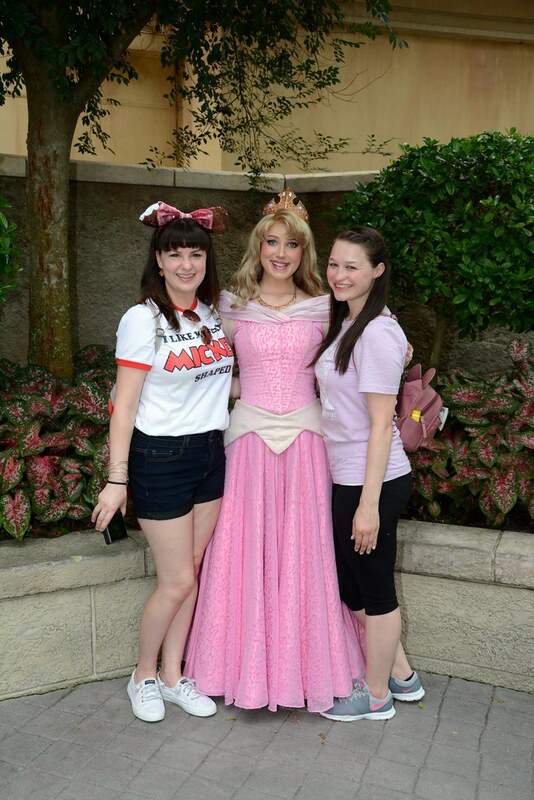 They also found Aurora so they grabbed a video and photo with her. 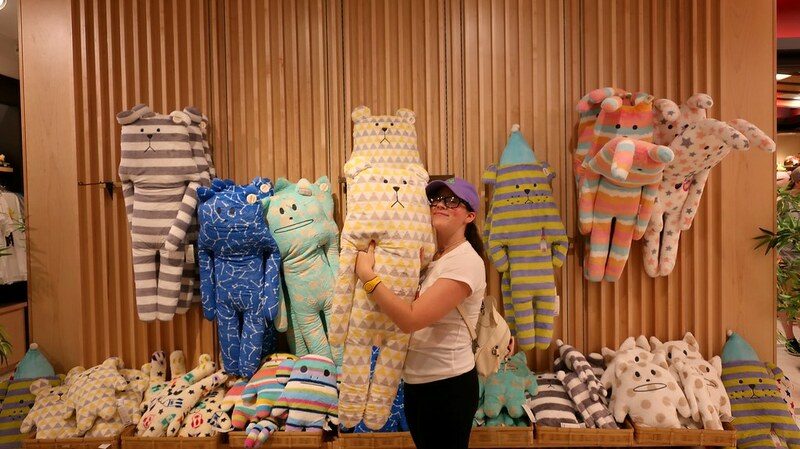 Jen, Jenny, Sadie and I stayed in Japan to walk through the store. At this point Sadie was fading fast and you could see it in her face. She had been drinking water but it was super hot and she had not been eating enough. She also didn’t want to go back to the room because she didn’t want to ruin anyone’s day. So we took it slow through the store and made sure she was okay. My basic plan was to get around the world then head back to the hotel to make sure Sadie got a break. 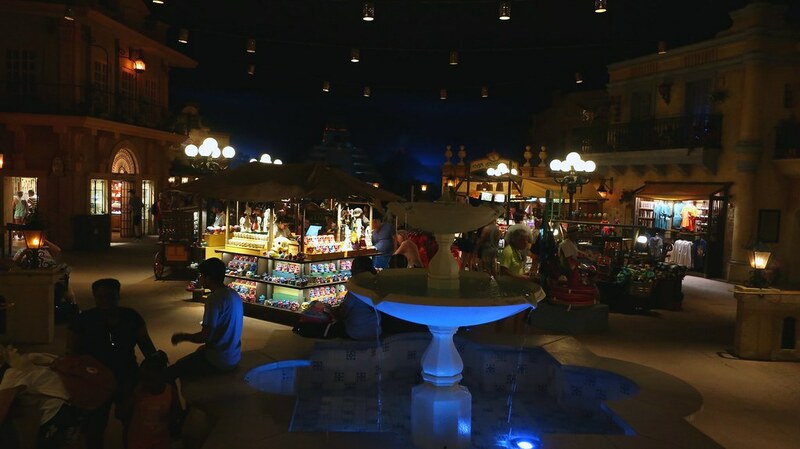 We met back up with the others in Morocco, looked around at the shops a bit, then headed to France to get something to eat. 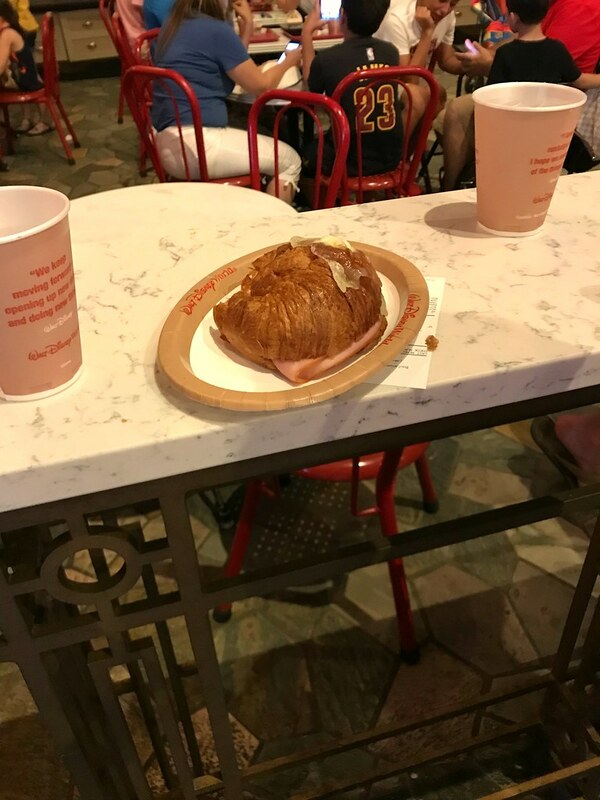 I got a ham and cheese croissant, as did Liz. Liz also got a slush of some variety though now I don’t remember which? Kyle got a bacon bun. Sadie and Kristen got some French bread. I apparently failed to write down what Jen and Jenny got? As we ate our food, a couple of Liz’s other friends met up with us. They went with us through to the UK, where we stopped so that Kyle could get a cider and fireball, Jen and I could get a cider and black, and I could get Sadie a larger glass of water to try and help her out. We needed to get food into Sadie, real food and not just bread. 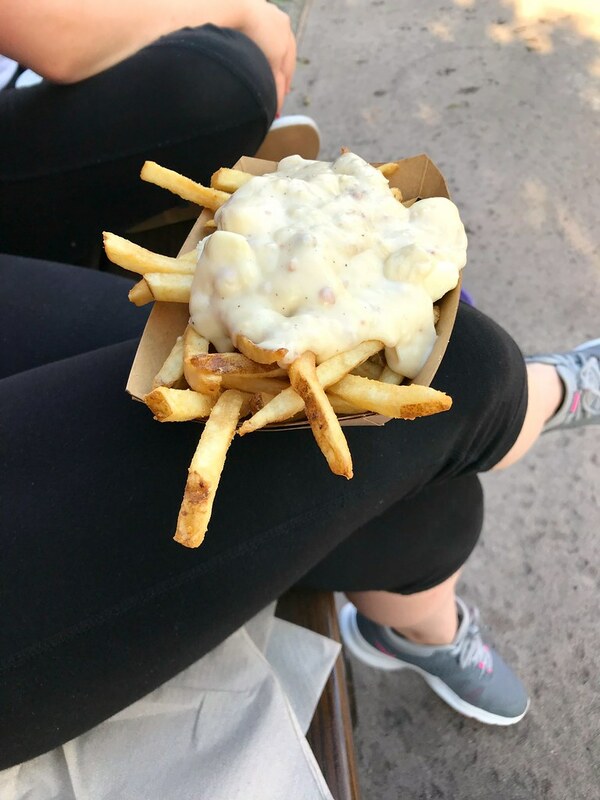 Of course I say “real food” and I mean we got the signature poutine at the Refreshment Port for Kristen, Sadie, and I to share. We barely got any food into Sadie. She was crashing and burning. Kyle and I were going back and forth about how we could help her. We decided that we were going to go back to the room and have her come with us. But she was being stubborn and didn’t want to leave. 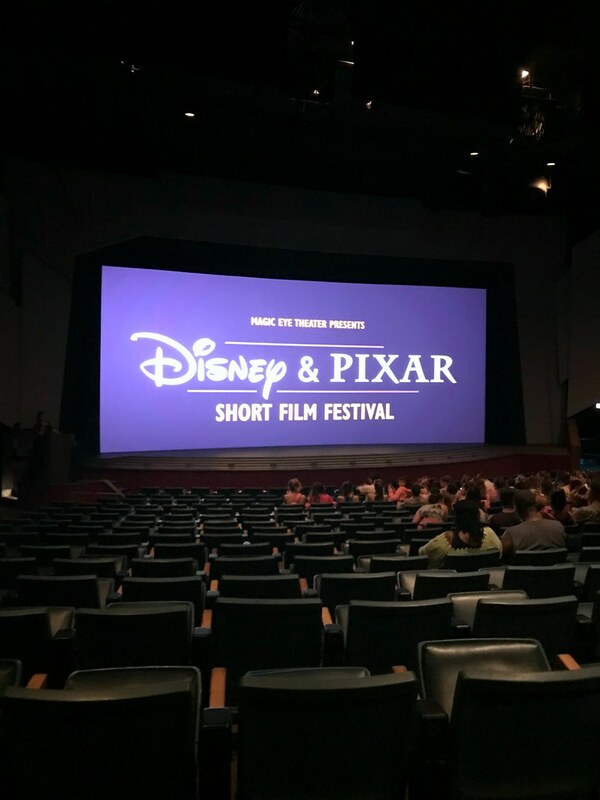 We got her to the Pixar shorts and had her have a sit down in there for a little bit. Finally, Jen, Jenny, Kristen, and I decided we were leaving and couched it as “let’s give Liz some time with her friends!” Kyle was going to come with us but decided to stay with Liz. We got back to the hotel around 8. While three of us stayed in the gift shop to look around a bit Kristen went to the cafeteria and bought Sadie a Powerade. Since the water hadn’t been working throughout the day we were hoping that getting some sugar and electrolytes into her might help a bit. We let her go back to her room to get changed and call her parents like she does every night, but then we told her she had to come back to our room so we could make sure she was okay. When she got back to our room she had some of her Powerade, walked over to Kristen’s bed, flopped length-wise on it, and fell asleep for an hour. Meanwhile, Kristen fell asleep on top of me in my bed. It had been a very long day. At some point both Jen and Jenny were napping in their bed. 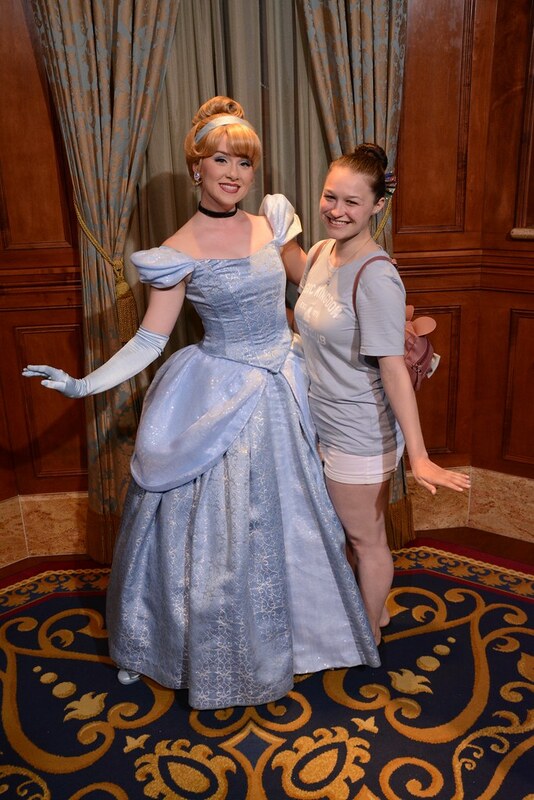 I had told Liz that I would meet her at Magic Kingdom around 10, but I wasn’t sure if anyone else was joining us at that point. And stayed to watch Illuminations. In the end, while I was getting ready to meet up with Liz the others stirred. Sadie felt a million times better (her words) and she looked much better. 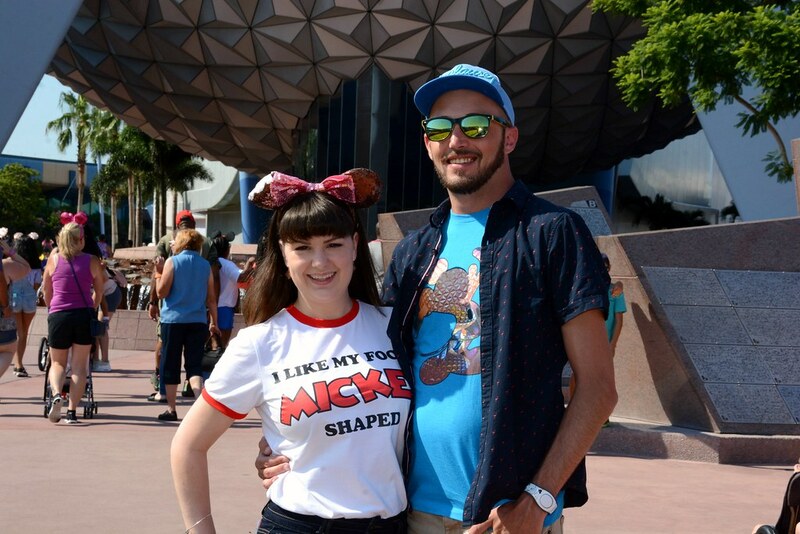 We all headed out to meet Liz and Kyle at Magic Kingdom. 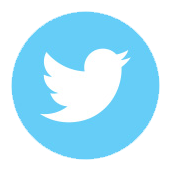 Quick update in the midst of a busy day! I just finished making something to bring to a friend's house later to watch the Super Bowl (I am the WORST when it comes to watching sports on TV so really it's jut a great excuse for me to see friends) but before that I'm FINALLY seeing Mary Poppins Returns this afternoon with my mother. Super excited! As I was trying to quietly get up and leave everyone else decided they were going to come with me to too. We quickly got changed and headed out to the elevators. 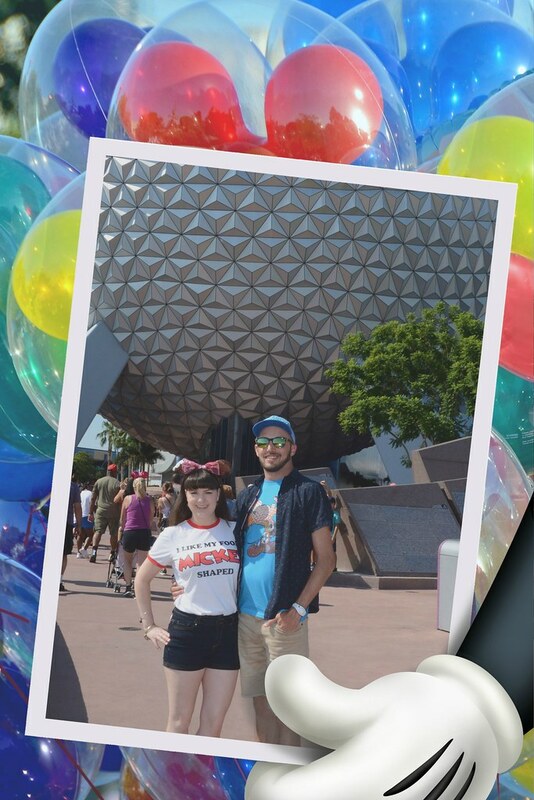 Kristen and I were very proud of ourselves because we had last-minute purchased matching t-shirts as a bit of a joke. The bus drive was quick and there weren't all that many people heading back to Magic Kingdom for EMH. 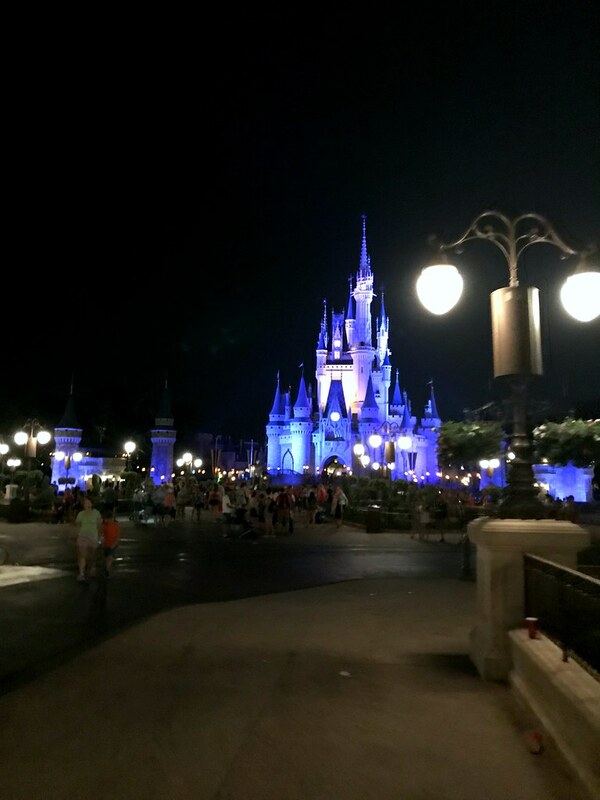 Magic Kingdom is probably my favorite park at night. 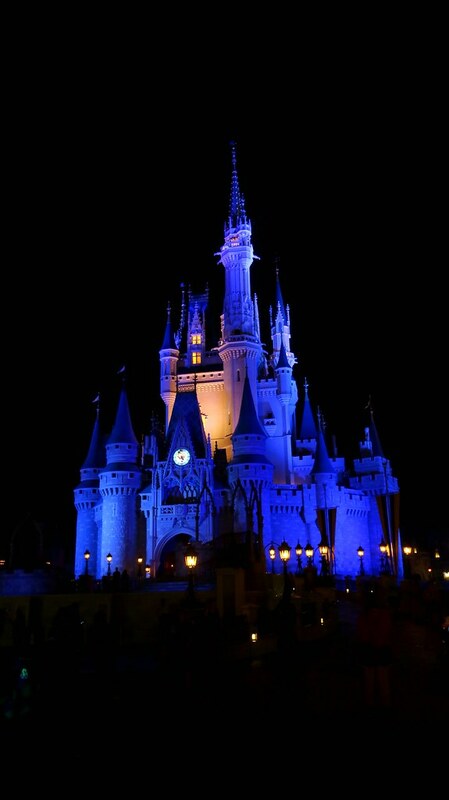 I'm actually a little bummed we never got to be in the park at night while we were down in January. We met back up with Liz and Kyle around 10. They were waiting for us next to Tony's. They were both kind of dragging but wanted to spend some time in MK at night. Jen and Jenny went to grab coffee at Starbucks so the rest of us sat on the hub grass and enjoyed a Pinocchio light show. 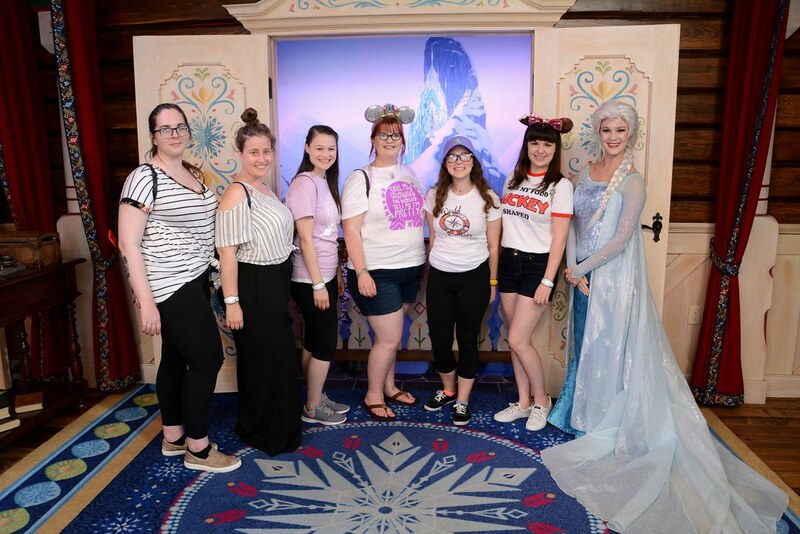 Once we were all together again we decided to do some things that we hadn’t gotten to do during the day the other day when we had been at Magic Kingdom. So we headed to Fantasyland! 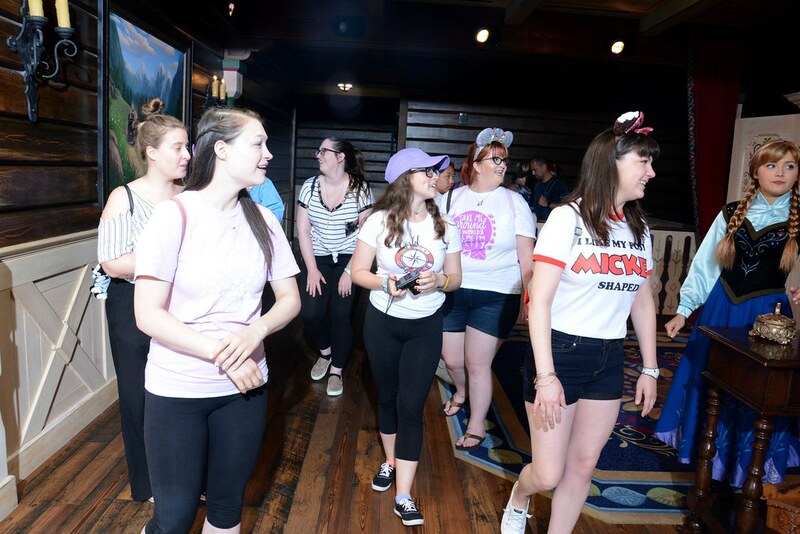 It was Kristen's very first time walking through the castle. She was very emotional and super excited about it. 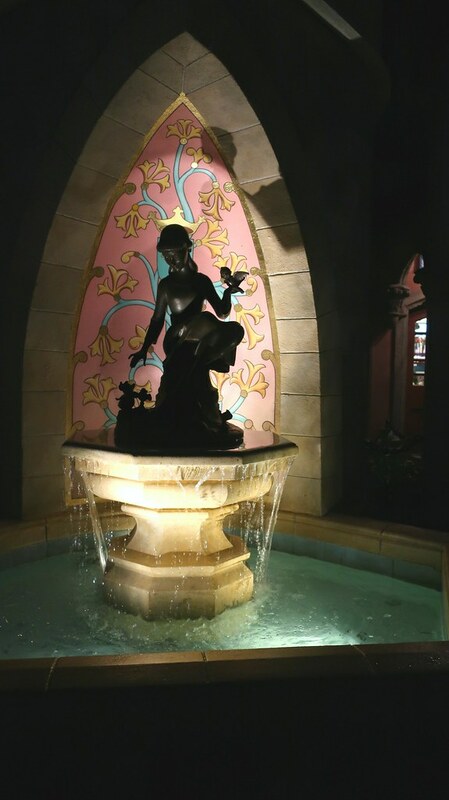 Though we got super sidetracked with Tinker Bell’s Treasures. We all got pixie dusted and made wishes - even Kyle. 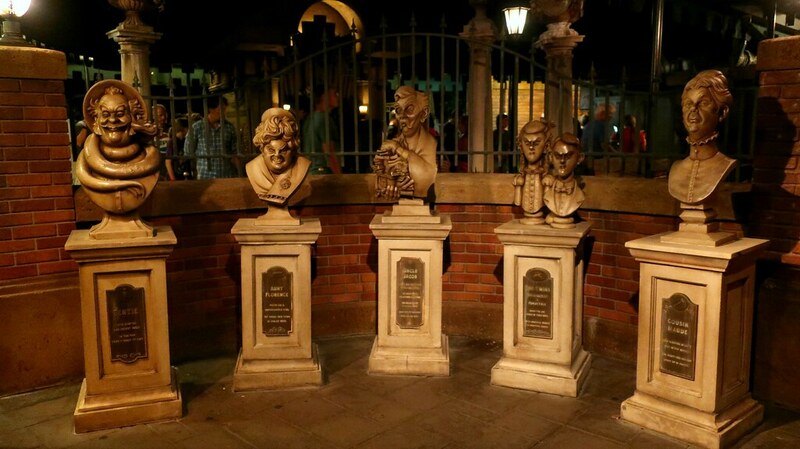 After that we headed to Winnie the Pooh and Haunted Mansion. I had to try to get this photo with my camera. I try every time and this is the first time it came out well. I didn't end up using my Canon a lot in January. I'm going to have to fix that in April. Such a great picture. It was 11:30 by the time I took this picture, so by the time we got out of Mansion Liz and Kyle were pretty wiped since they hadn’t had a break like everyone else had had and had been up since 6. We said our goodbye and they headed back to the room. The rest of us were tired but didn't want to leave yet and had to try and figure out what we wanted to do next. We were coming back to Magic Kingdom the next morning so we figured we should do rides we either didn't have FPs for later, rides we wanted to go on again, or things we knew the other people with us didn't like. Since Kyle doesn’t like Small World and we were right by it we decided it was a great time for us to go on it. There wasn’t really a line so we headed on down. We were supposed to have our own row on the boat. There was a very possibly drunk, very rude woman who ignored the CM who told her not to get in our row, tried to cut us, and tried to get confrontational with us. I didn't write down exactly what happened but, from memory, she wasn't supposed to get into the same boat as us but was supposed to get into the boat behind us (it was so slow they were basically just running private boats for groups as long as they were larger than like one person). So we got into the two rows we were supposed to get into and her daughters continued to walk down to the row(s?) they were supposed to be in. She decided they shouldn't go into that row and basically told us we were in the row she was supposed to be in. When we told her this was where we were supposed to go she said we were trying to break up her family and how dare we. Her girls were less than thrilled, telling her to stop. When the boat came over she was incredibly condescending about "go ahead girls, I'll make sure you get on." She was less than thrilled when we did not take her bait; she tried to make so many jabs at us but we just ignored her and enjoyed the ride together. By the time we got to the second room she was quiet and pouting. I haven’t done Country Bears in a long time, so it was nice to see it again. But let me just say - it was us and then a much older couple in the theatre. We didn't really sit together - they decided to sit in the back of the room and we sat near where the CM stands at the door. He was very clearly exhausted and trying to keep himself awake and have fun so he was super animated and cracking some ridiculous jokes. But with the lack of people in there and the way the theatre is built it was echo-y and like a weird, surreal experience. We still talk about it even now. Also they now get the weird songs I sometimes sing. It was close to 1 am and we were exhausted so we headed home. A bus was at our stop when we got there but it was full. Another bus pulled up pretty quickly, however, so we were able to hop onto the bus fairly quickly. We were back at the hotel by 1:30 and we had collapsed into bed by 2.
xlsm and Goldys4 like this. Chapter 05: Shut Up, You're the Worst, I Love You! This was a day in which I, apparently, gave up on taking photos? 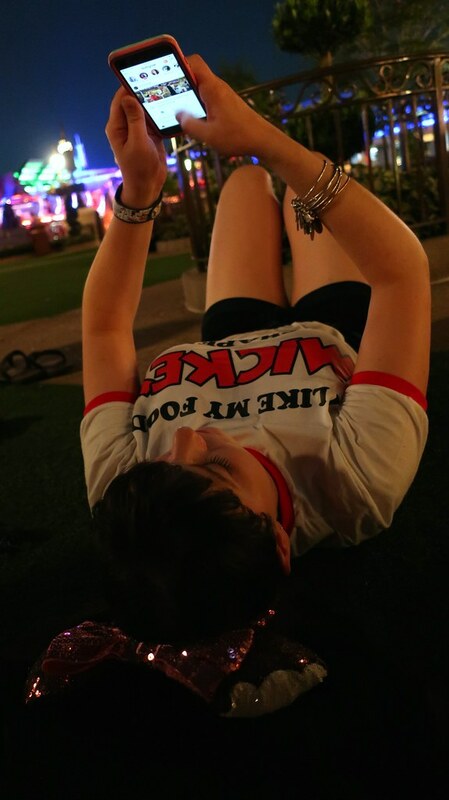 I was just reviewing my photos and have like….maybe a dozen from this day? After our late night adventures and Liz and Kyle’s long day without any breaks, we decided to get up a little later than we had been and get to the park mid-morning since we were headed back to Magic Kingdom. So we were up and out around 9:30. It had been hot most of the days we were there - I mean it WAS July - but this was the beginning of two incredibly hot, uncomfortable days. 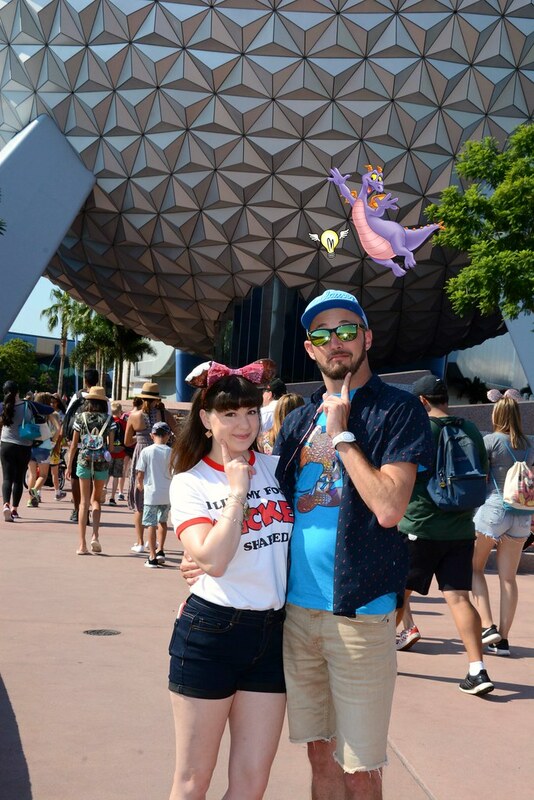 We had some fastpasses for the day but we decided to mostly just take it slow. 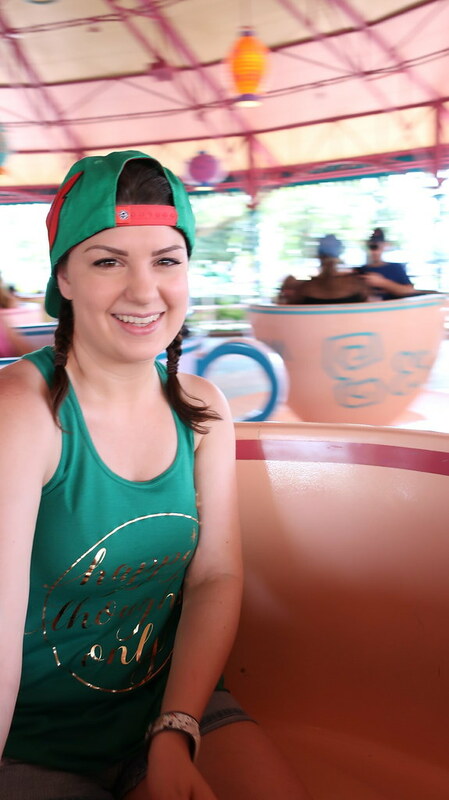 So when we got to MK we grabbed ice coffees (tea, in my case) and headed into Tomorrowland. 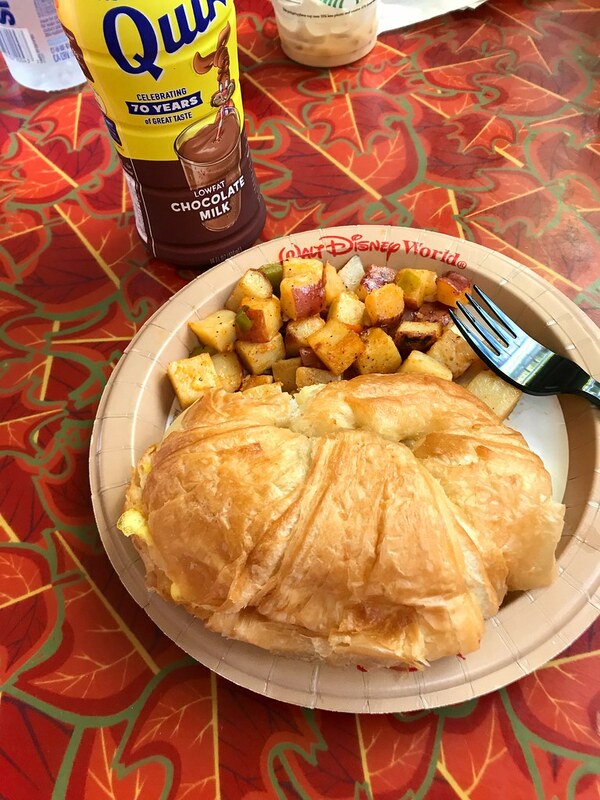 Our first FP was for Space Mountain so after we finished our “breakfast” we headed that way. There was basically no line and we were in and out quickly! I apparently only saved this one? Now, I know some people love Laugh Floor. Don’t get me wrong, we had a great time! I am just always super uncomfortable with the idea of forced audience participation. It makes me super anxious. So I’ve never gone. But Kyle and Sadie really wanted to try it, so I agreed. And we did have fun! And none of us were chosen, though I think I would have been the only one who would not have liked it. When we got out, we started to head towards Fantasyland. 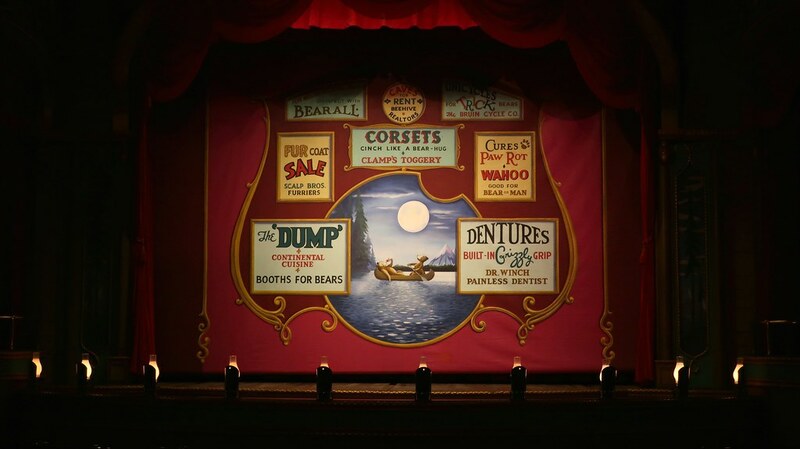 Our basic goal was to move as slowly as possible towards Frontierland and our next FP. 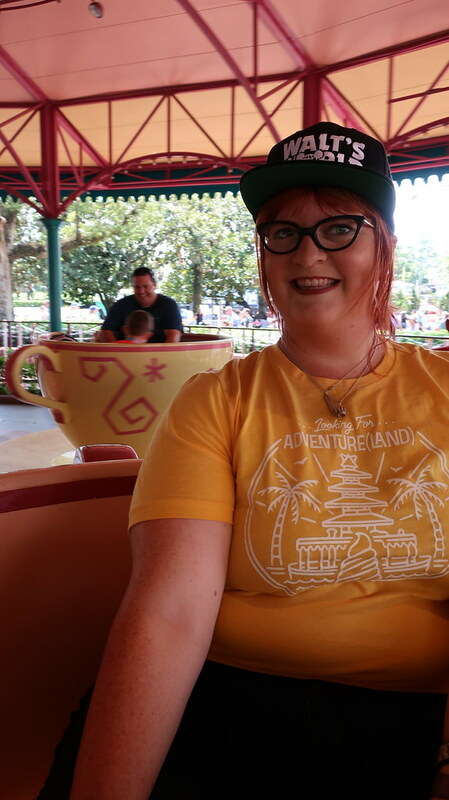 We made it to the teacups, which was something Kyle had really wanted to do the night before but had been too tired to do, so we agreed to get n line. 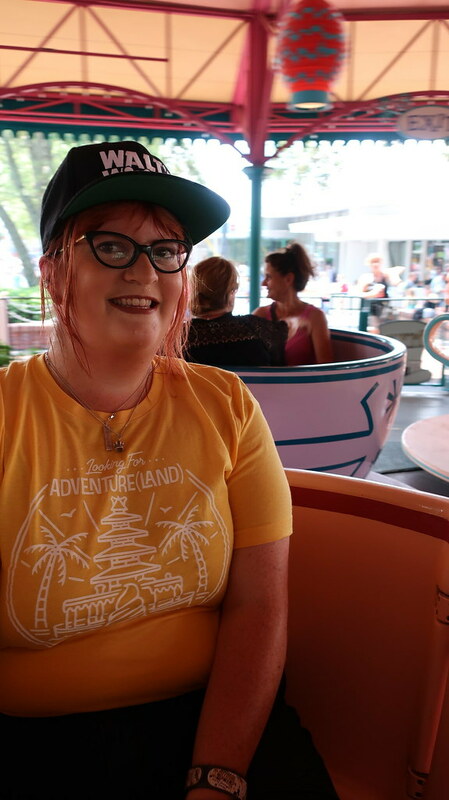 Jen isn’t a huge fan of the teacups - when we were in college I may or may not have gotten her really sick on the teacups once, accidentally - so she and Jenny decided that they’d go looking through a couple shops and meet up with us afterwards. 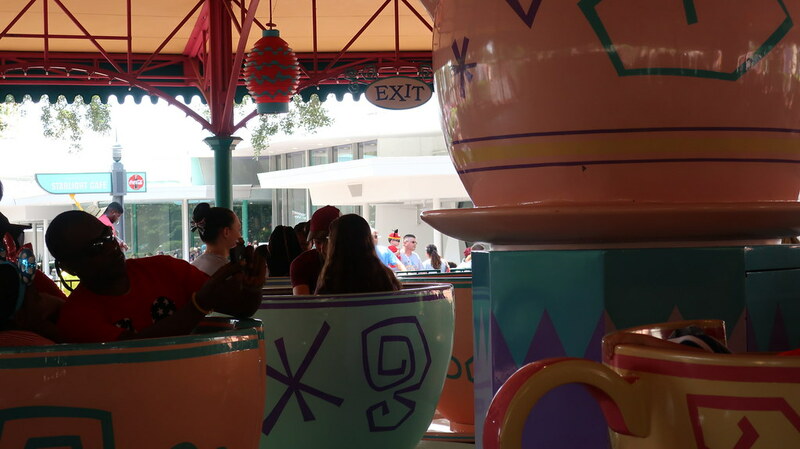 Kyle, Kristen, and Sadie got into their own teacup because their goal was to go fast. Liz and I went into our own. Our goal was to enjoy the ride and take cute photos. By the time we got off it was close to our FP window so we headed to Frontierland. 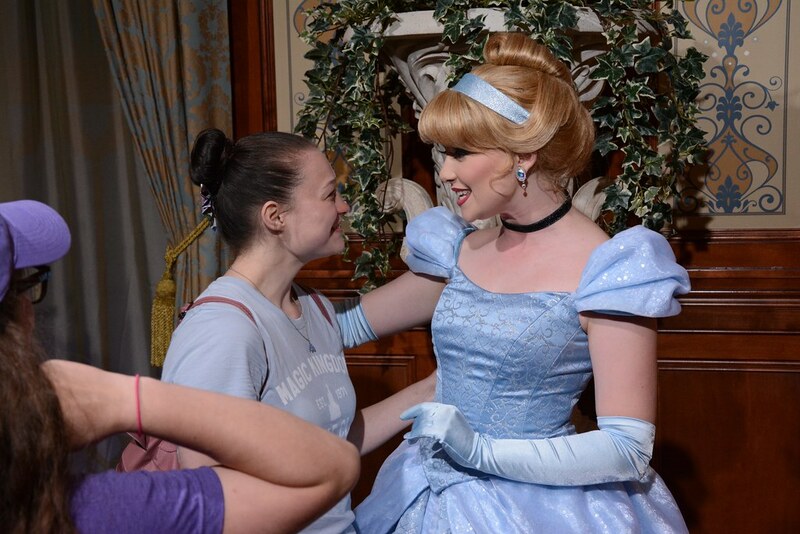 Liz was getting a little nervous - she really wanted to grab a video of Snow White before we left Magic Kingdom on this day because she wasn’t sure if they’d be back in MK in the morning again and this was the only time she would have to do it. She also is not a fan of our next FP - Splash Mountain. When we got into Frontierland the line for FP was up to the store and didn’t look like it was moving anytime soon. 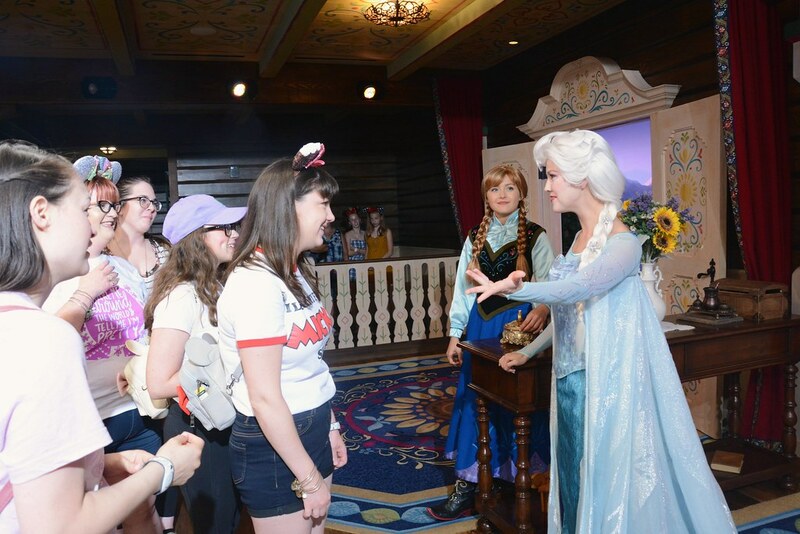 She opted to skip the ride in favor of getting to Snow’s last meet and greet time of the day and told us she’d meet up with us back in Frontierland and to let her know if we changed our minds about waiting in the line. Liz was waiting for us on the bridge as we came down. When she saw us she called to us so we would wave. PS: dear couple in the front of our boat. You were so much fun, thanks for being awesome and joining along with us as we teased each other! In a lot of cases I felt badly for the one or two people that got stuck riding with us but the couple in front of us were great about it and were laughing along with us. 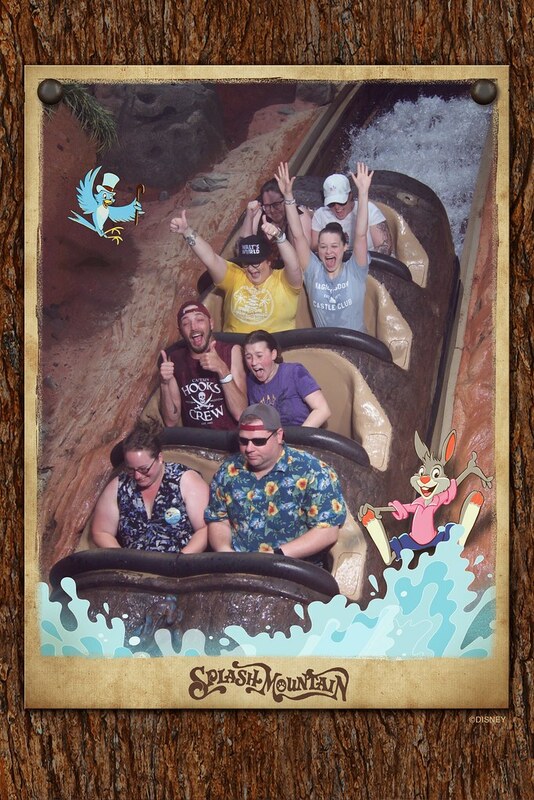 Also, you might not notice it from the photos, but we 100% had our ponchos in our laps. When we got in line, Kyle pointed out that it was close to our lunch ADR. We all agreed that we didn’t want to risk sitting on upholstery with wet shorts (since all of our shirts would dry a heck of a lot faster than our shorts) so we wrapped our ponchos around our waists like skirts as we sat down in the boats. It worked really well in all honesty! Once we were off the boat we all met back up and headed for lunch. 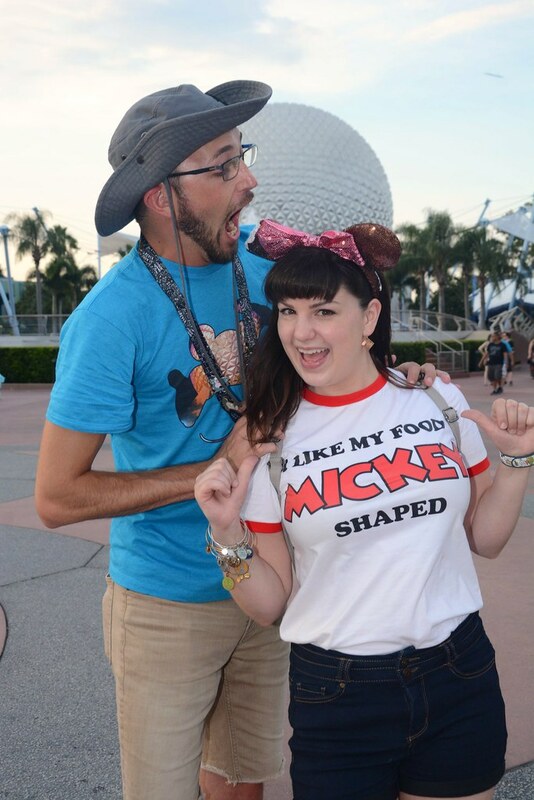 Back when we made our ADRs, Liz, Jen, and I made the decision that we would let the people who have less experience in Disney choose our meals so that we knew they would get to experience something they wanted to. 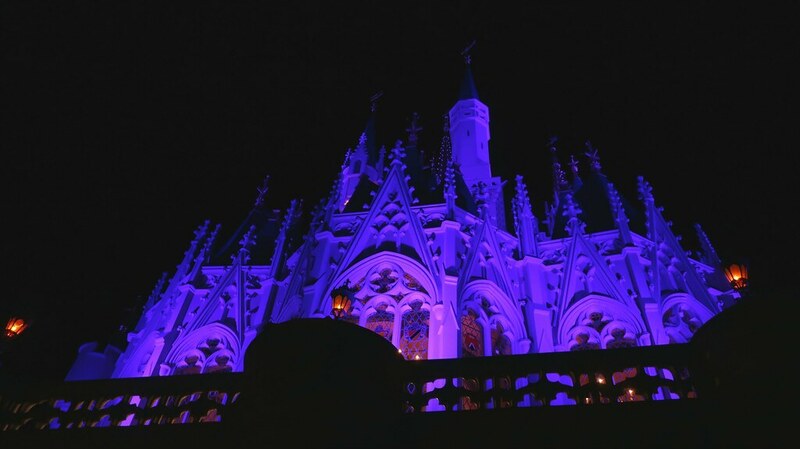 Jenny and Kristen chose Be Our Guest, and Kyle chose Skippers. So we were headed that way. 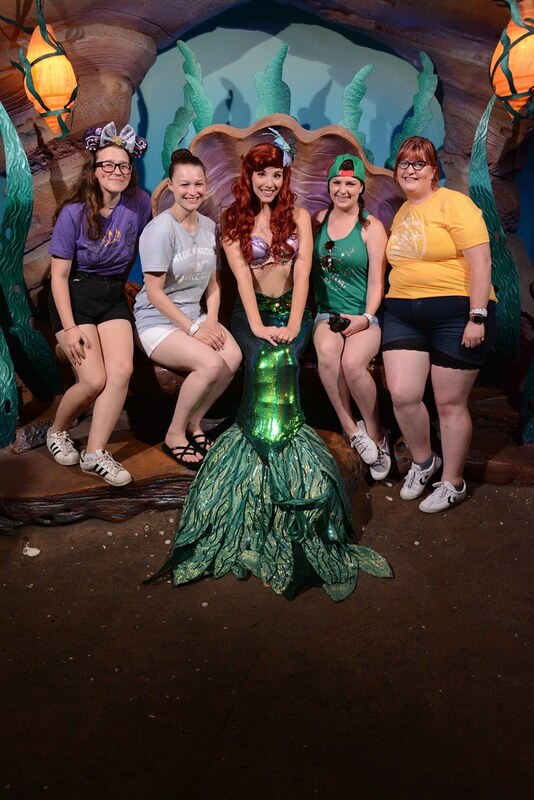 But we ended up heading to New Fantasyland to see how long the wait for Little Mermaid was since we had way more time before lunch than we anticipated. 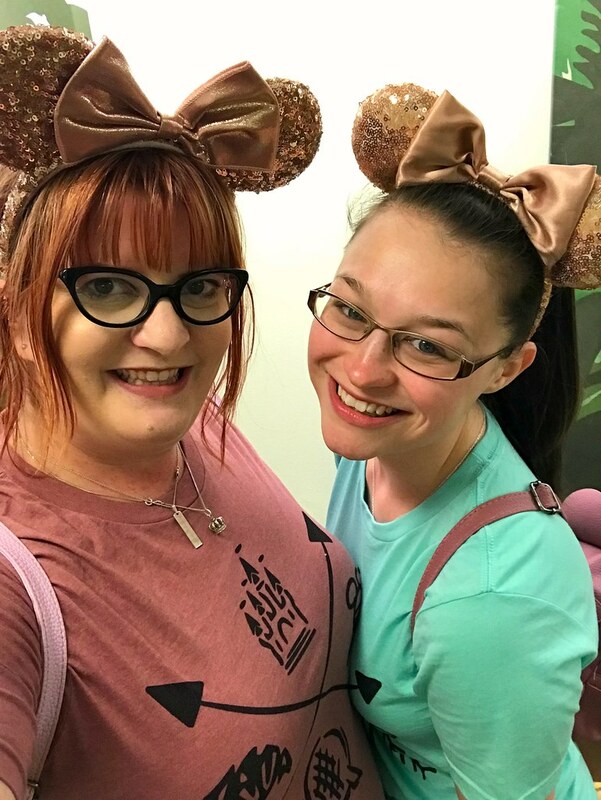 As we were walking around some of the shops Kyle pulled me to the side and said that the night before when we had gotten pixie dust Sadie had told him that her wish was for there to be more Moana merchandise and as she turned around she saw the Moana dress. During the entirety of this trip, Sadie had been struggling with the idea of buying anything for herself. So Kyle asked if we minded pitching in $10 each for him to go buy her the largest size in the dress. He left quickly and when Sadie asked where he was going we told her he was just running to the bathroom. We made sure to kind of steer clear of the store Kyle was going to as we headed to lunch. 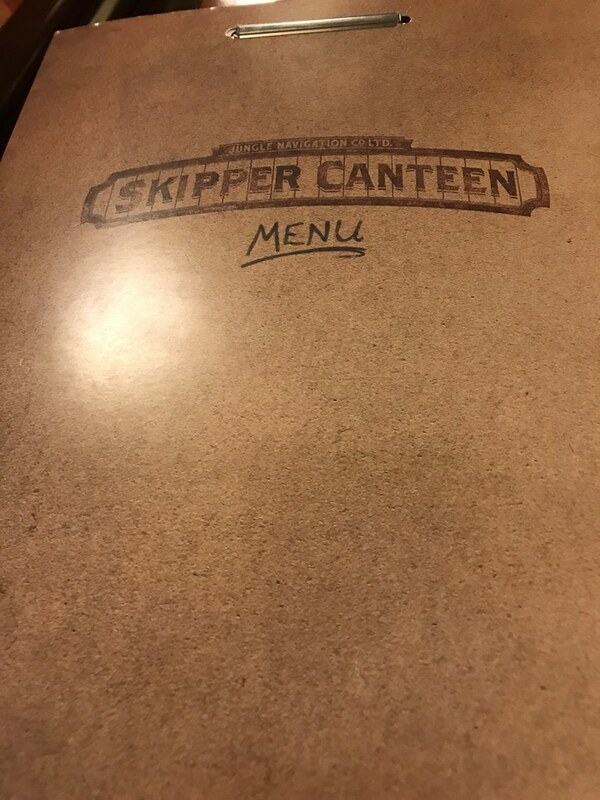 Last time I was at Skipper’s the wait took FOREVER because it was a party night, so they took everyone who wasn’t going to the party first it felt like. I had warned everyone that, if it took that long for a party of four it may take longer for a party of seven to be seated. It took maybe 10 minutes to seat us and we took advantage of the time to have some water and relax in the enclosed part of the waiting area. 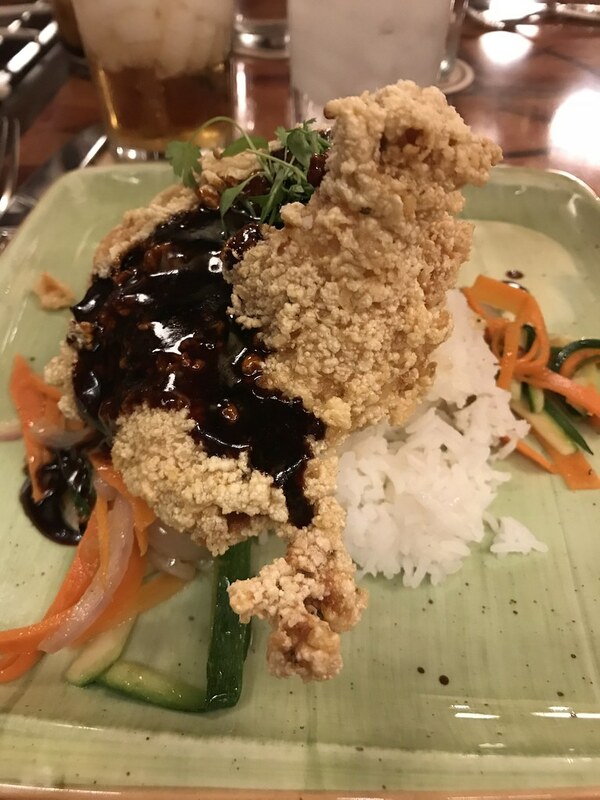 We all ended up getting one of two things - the pork of the chicken. Kyle and Liz got an appetizer but I don’t remember what it was. Once we got our orders in Kyle pulled out the dress for Sadie. 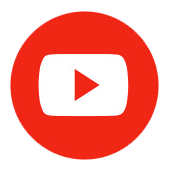 It is part of my video montage for the last few days that’ll I’ll post once I’m done with this TR. It was adorable. Once we finished with lunch we decided we would get dessert out in the park so we paid up and headed on out. 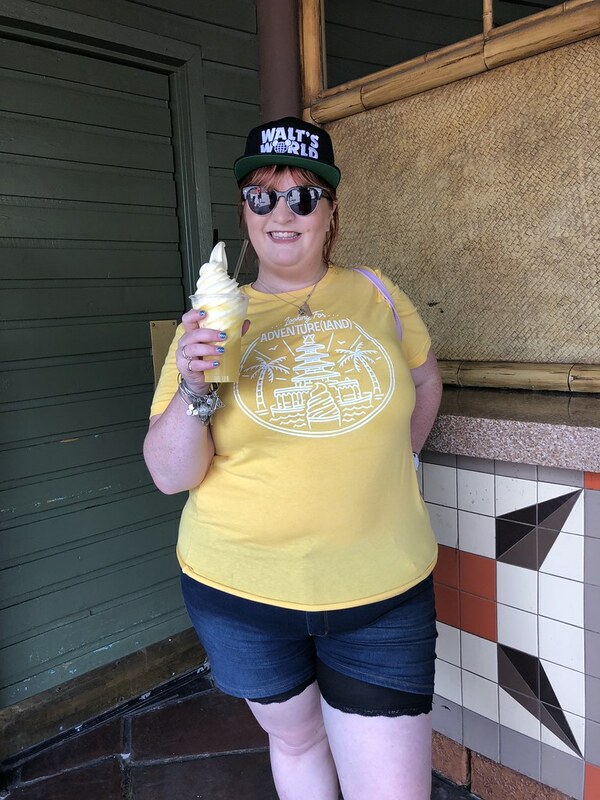 Also, I had the perfect shirt for Dole Whip time. We enjoyed our Dole Whips in the shade of the Tiki Room exit and contemplated what we wanted to do. 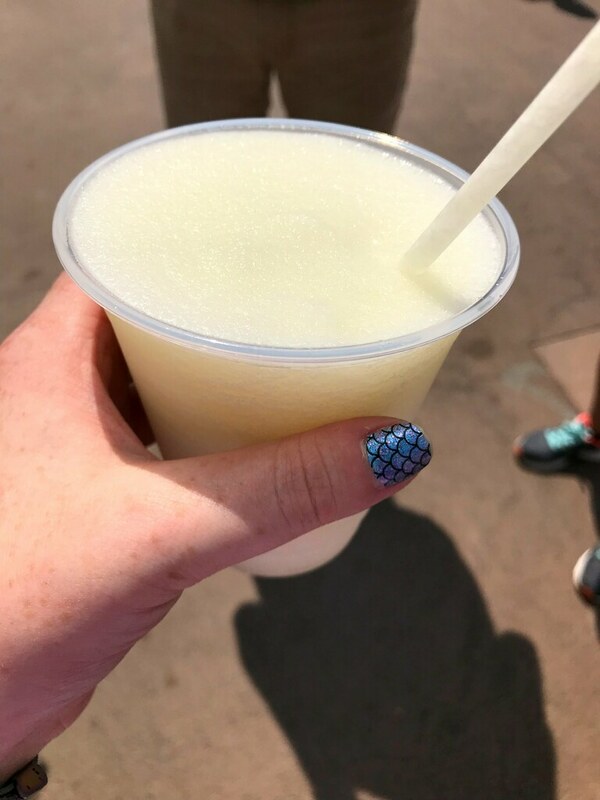 We had one more fastpass in MK that we were definitely using, but we had made it later – around 4:30 for a start – in case lunch ran long as it can at Skipper’s. I don’t remember what Jen and Jenny decided to do but I know they went off on their own. 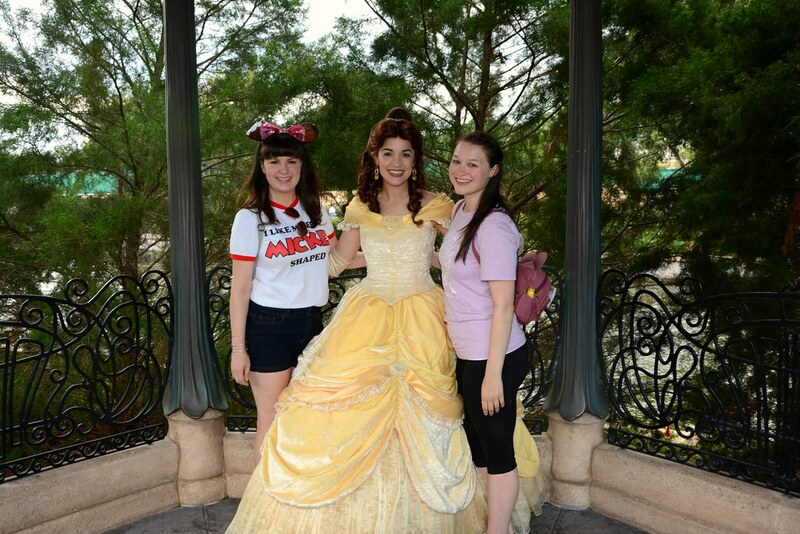 We decided that we’d meet them in Big Top Souvenirs while the rest of us went to the Ariel Meet and Greet. 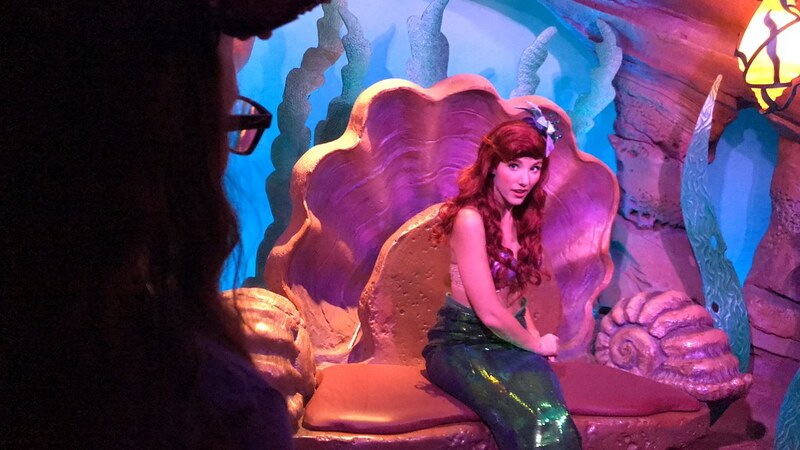 Ariel was not a fan of how Ursula’d up Sadie was. Kyle was actually with us. 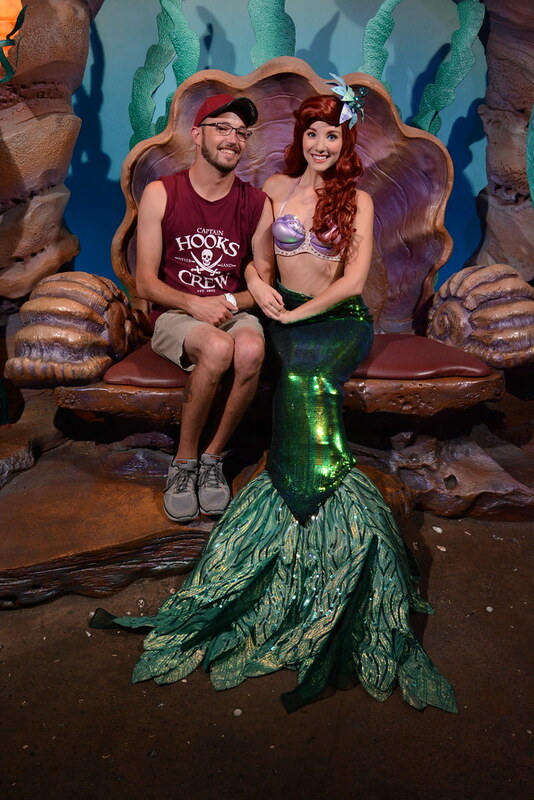 I had thought I had a photo of just him with Ariel but apparently I do not have one? Upon further MDE-searching, I found it! 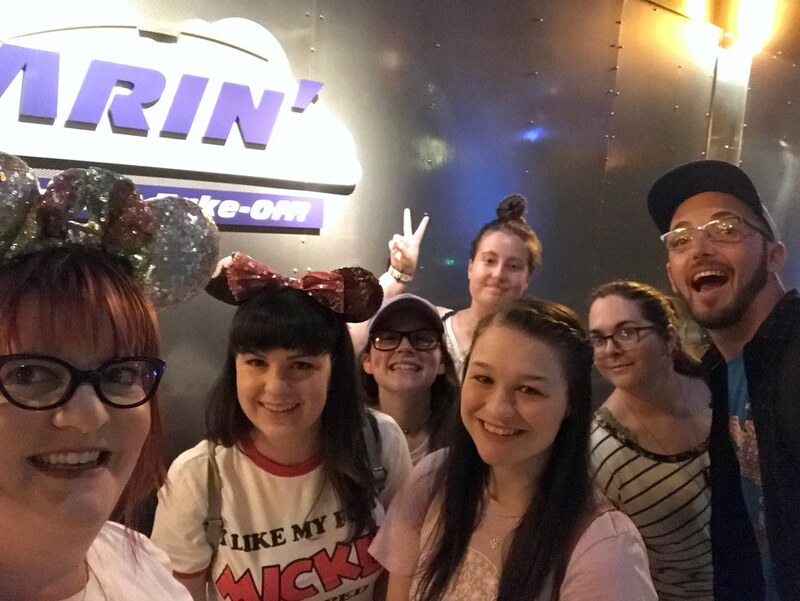 After meeting up with Ariel we all came back together and headed on over to our final FP for the day, Peter Pan’s Flight! 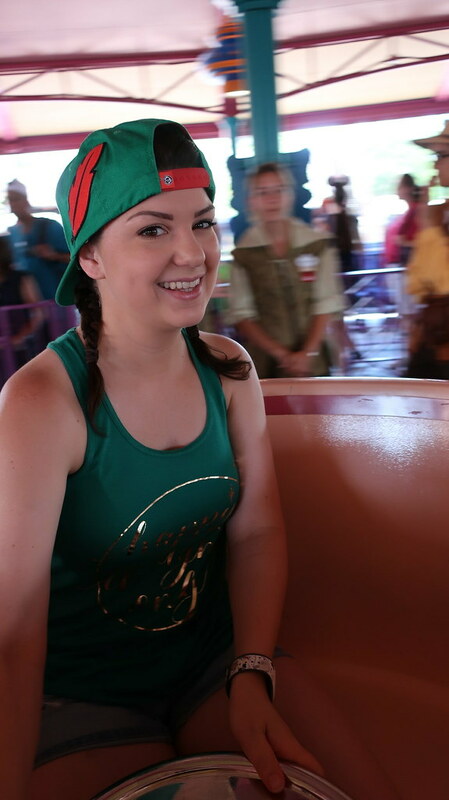 If you haven’t noticed, Liz and Kyle came in theme for this ride on that day lol. In true Rose Gold Rat Pack fashion we were e-stopped on the ride for a solid 5 minutes but it started up again fairly quickly. But ultimately went back to the room and read/relaxed/cooled off for a bit. Jen and Jenny went to check out the hotel and look around the hotel gift shop. Kyle got a drink and went back to his room for a nap. We had chosen to forego mousekeeping in our rooms as we would be using the pull out beds and didn’t want someone to make them and fold them away every single day for our sake as well as theirs, but we did have a very nice mousekeeping manager pop into the room (she knocked, she didn’t just walk in, regardless of what that just sounded like!) and just do a quick look around while I was sort-of reading and sort-of napping alone in our room. 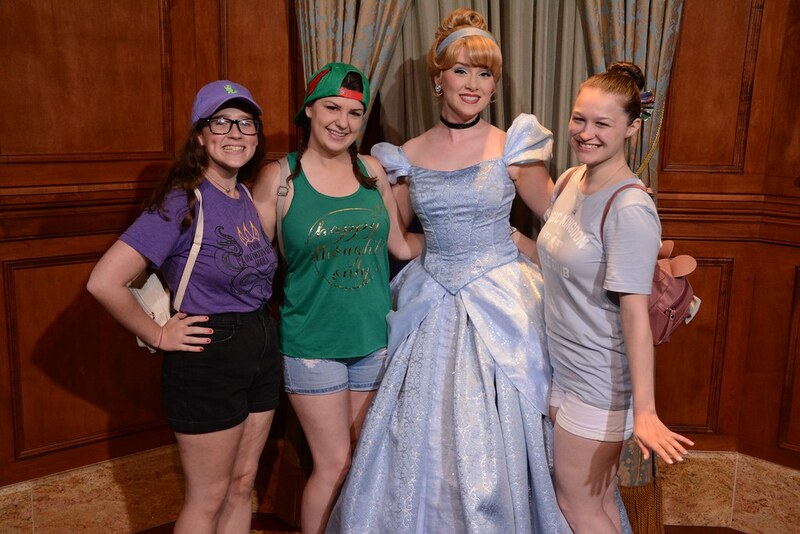 While we were lounging around, Kristen, Sadie, and Liz went to meet Cinderella, who is Kristen’s favorite! 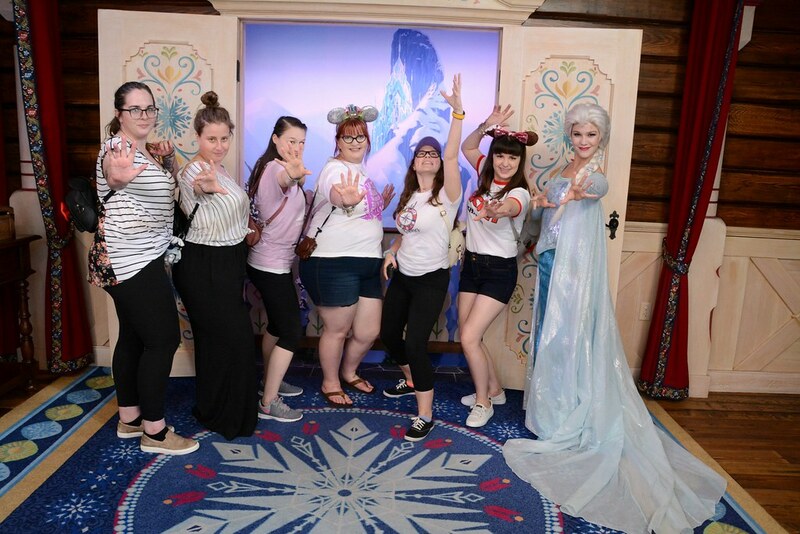 (they also met Elena of Avalor, but the picture refused to download). They also got Mickey pretzels before coming back to our room. Reunited back at the hotel, we stayed pretty much crashed until 8-ish when we began to get hungry. 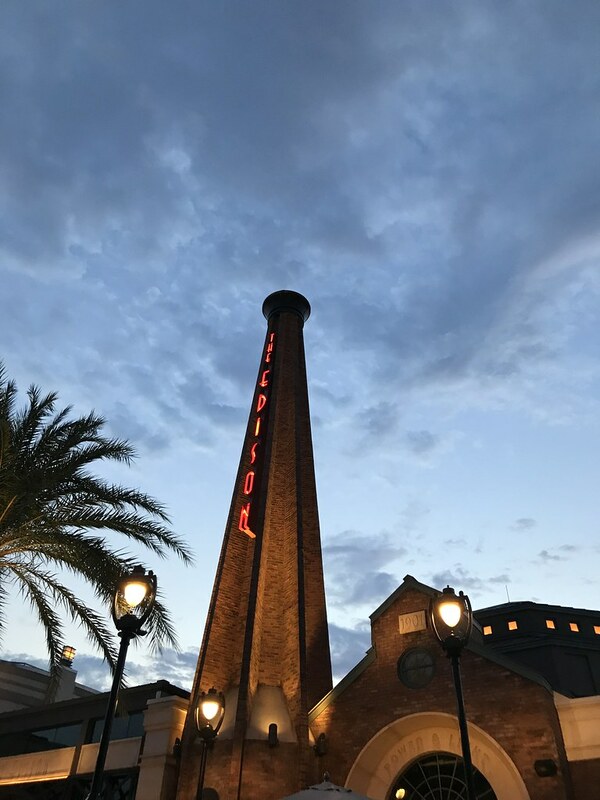 We all hadn’t been to Disney Springs yet, so that was our destination! At this point I was just dreaming about the Edison and wishing we could go there. We hadn’t planned my birthday dinner there by that point. Mmm…I promise, the Edison night of my other TR will be filled with so much food, thanks to their menu and a too-nice acquaintance. But that’s a story for another Trip Report. 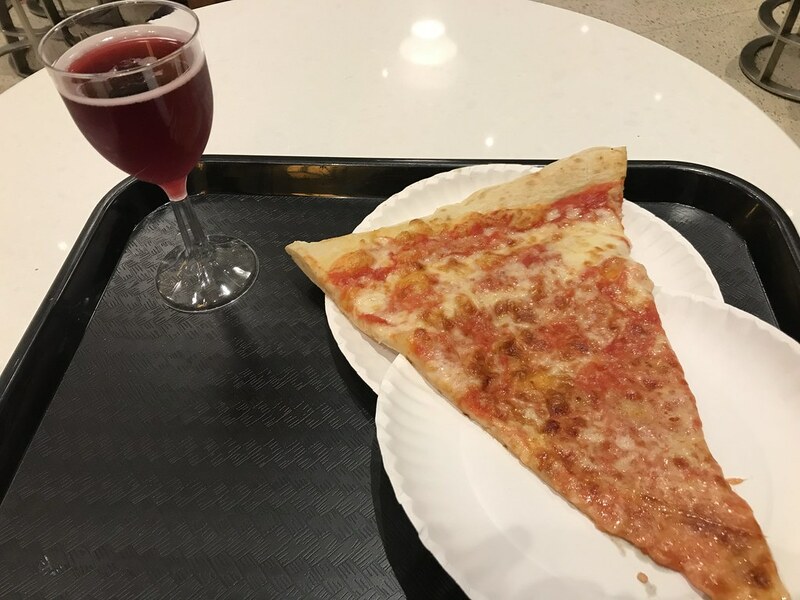 A big ol’ slice of cheese pizza and a glass of Rosa Regale. I was so hungry at this point I made 0 efforts to remember or write down what other people got. We all really liked our pizzas though! 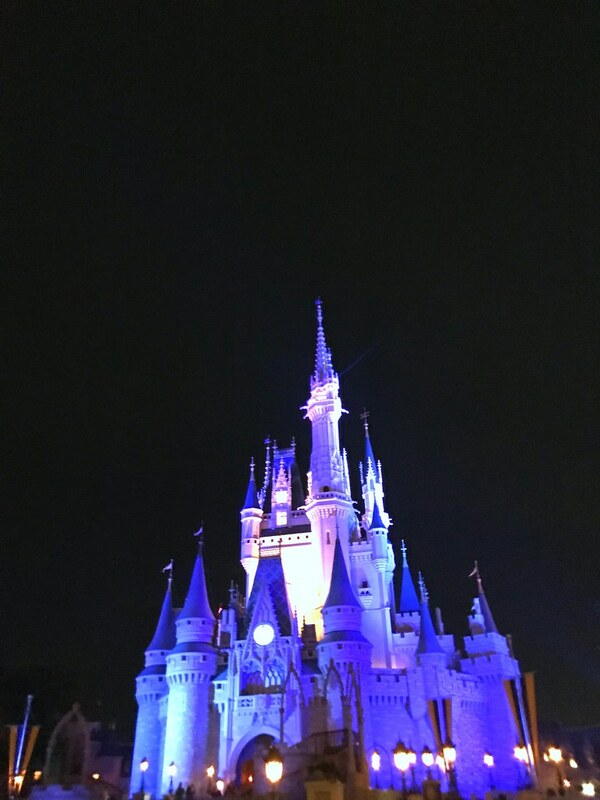 We wandered around World of Disney. 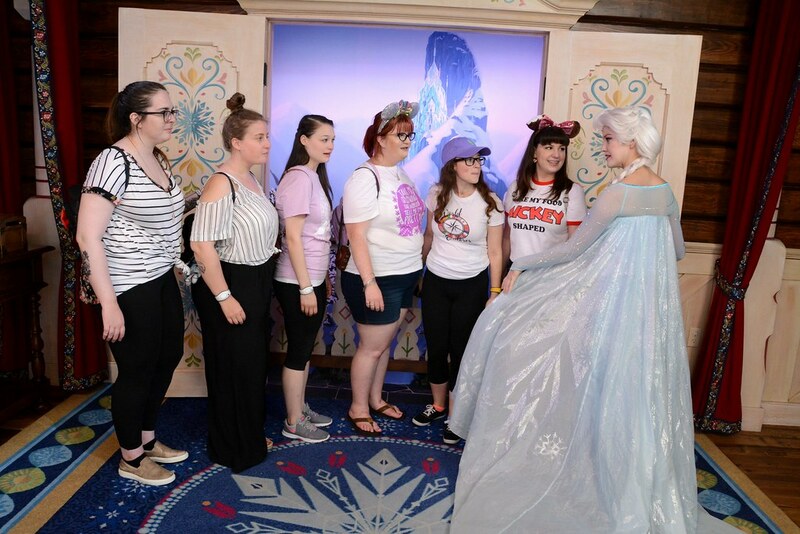 Kristen really wanted the Cinderella spirit jersey that we had seen at Disneystyle but they didn’t have it in WoD or Tren-D. I ended up getting a nautical blue and white striped spirit jersey that I had seen our first night. I actually lost my friends because I bee-lined for it. No regrets! Quick, existential question though – how many spirit jerseys is too many? 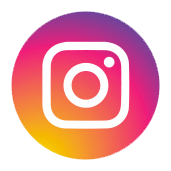 I feel like I have gotten one on nearly every trip since their inception a couple of years ago, in varying colors and sizes. So I have my original black WDW one that’s an XL, a teal (shock) DL one that’s 2XL that I sleep in, a L Rose Gold one, and the nautical one is either M or L, I don’t remember (so I can wear them with jeans or leggings and not have them look odd). I didn’t get one in January even though I still ended up with a sweatshirt, but while Liz and Kyle were gone last week they ended up buying me the Haunted Mansion spirit jersey. Do I have a problem? I mean, probably, but I also barely ever wear sweatshirts so I guess that’s a good enough reason as any to buy what I like, right? Anyway, we began heading back towards the buses but Kyle really wanted to stop at the Art of Shaving and look around. We were all kind of tired by that point but we didn’t want to leave him just because he was going to a store we weren’t interested in, especially because he had waited for Kristen at Sephora earlier in our Disney Springs adventure (her eyeliner had broken – like, the pot shattered – that morning when we were getting ready. 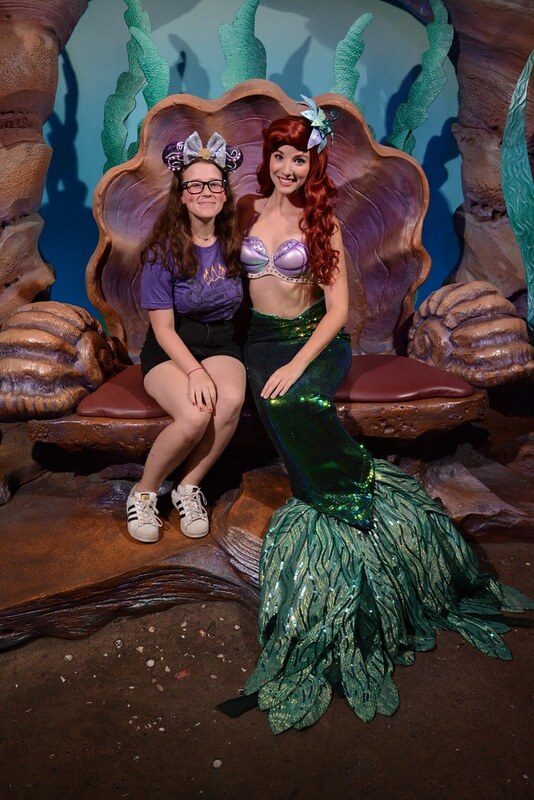 Since we were in Disney Springs she popped in to see if she could get another one). We all sat on the stoop in front of the Art of Shaving and people watched. It was starting to slow down in Disney Springs. 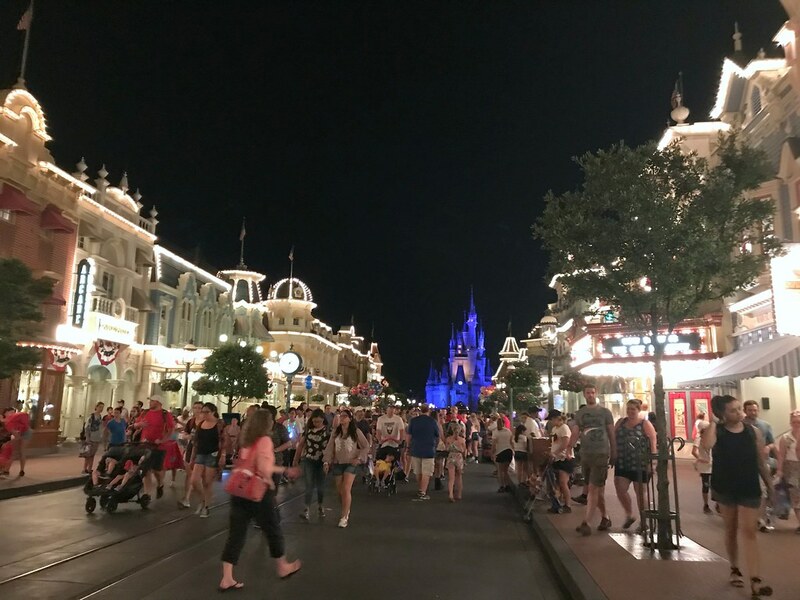 It was close to 11:30 by this point and while it was a Cast Member night and lot of restaurants and clubs were open and packed the shopping areas were starting to clear out. So while it felt like every CM and their mother was in Sephora (I tried to help Kristen, but couldn’t handle how packed it was and had to leave) using the samples to do their makeup for the evening, Kyle was the only person in Art of Shaving. Which was great for him, because he was able to get really good, helpful service from the guys who were working in there and ended up buying some products. Kristen was hoping that, since everything else was still open, Disneystyle would also be open and since it’s right near the buses she ran over while we all went to wait for her. But she got there right as the doors were closing for the night. She was heartbroken, but we promised we would find a way to get back to Disney Springs before we left. We were dragging by the time we got back to the hotel around 12:30. But the next morning was our DHS day. We had big plans to get there early and enjoy as much time as we could out of it since we were only going to be there for the morning/early afternoon. About a week before we left for Disney, just after the opening of Toy Story Land, Disney had given DHS AM EMH every single day for the month of July, and DHS was already opening earlier than normal (around 8 am) so our plan was to get to Studios basically as close to the beginning of rope drop as possible. Would we make it? I guess you’ll have to see. I was way more behind than I thought! I had convinced myself I was on top of things, but apparently not!! I LOOOOVE your shirt. 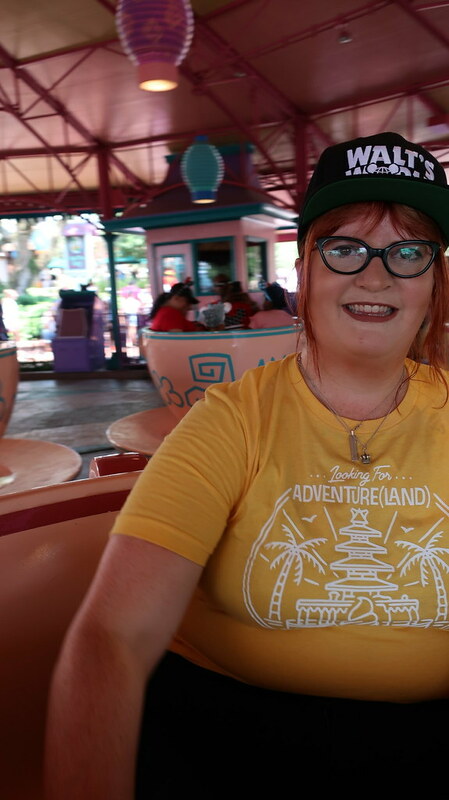 All the pics on the teacups came out cute. The eternal struggle. I have rose gold and potion purple, and then i have a plain navy one that says Fairmont on the back from our hotel in San Francisco, and a white/hot pink one for our local university. I wear my Disney ones all the time with skinny jeans or leggings. I can think of at least three or four more that I want! I also have quite a few... I seem to have become obsessed. They are so comfortable to wear and I seem to keep getting more with my eye on at least another. 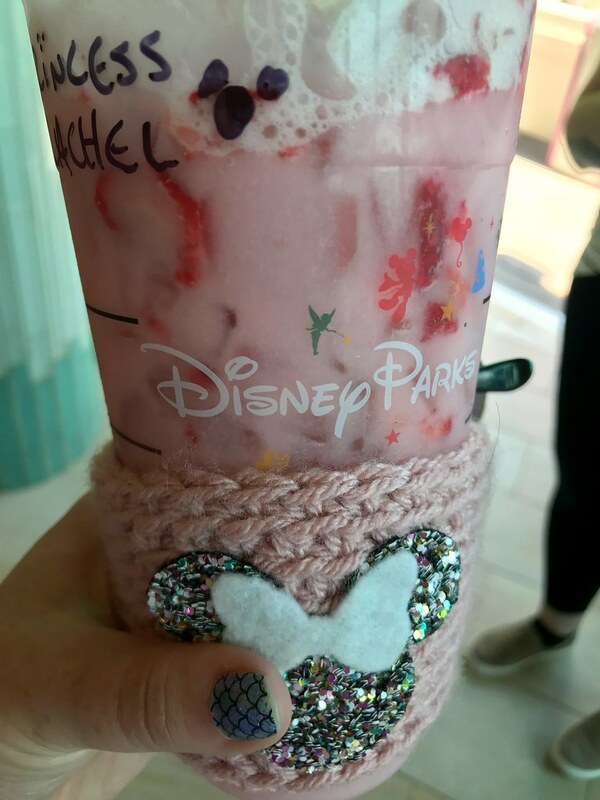 Rose Gold, then Minnie Mouse, then a Christmas one, then purple potion (I have Disneyland and am seriously thinking of getting Disney World too since I love purple so much, and am thinking a back up would be a good thing), then the millenial pink DVC one, then the new Flower and Garden with Minnie. And sadly, I think I might be missing one. Oh and my Chicago Cubs one. And yes, I feel an intervention is probably warranted. Am enjoying your trip report a lot. Genius! I always worry about my pants/shorts getting wet and being uncomfortable! I can deal with the shirts easy enough! I'm totally going to copy this!